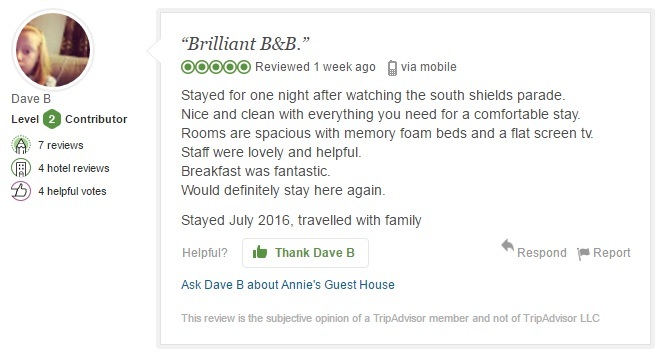 Have previous guests enjoyed their stay at Annie's Guest House in South Shields ? I've enjoyed my stay here. My Vegan diet was well catered for. Very nice, thank you. 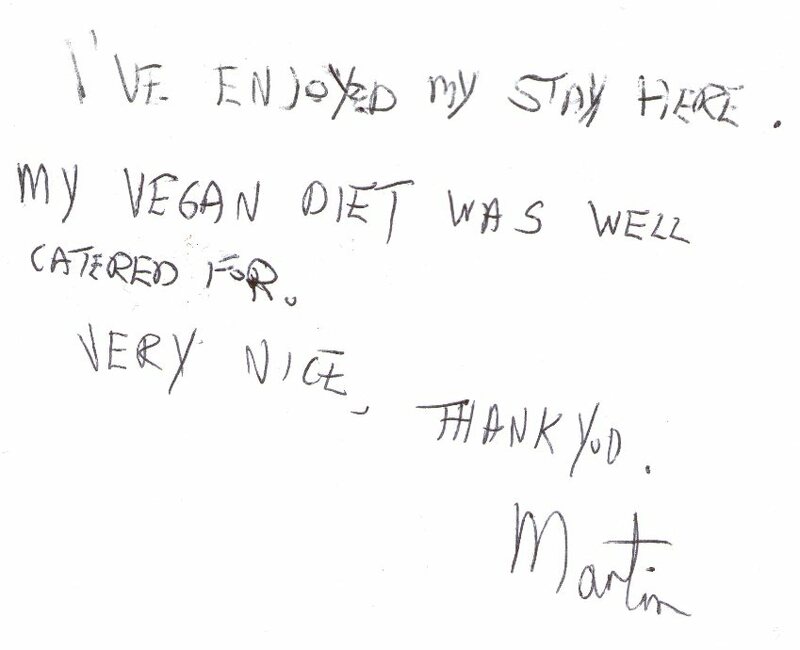 - Guest feedback from a Vegan guest who stayed with us for two nights. Stayed for two nights at B+B. Very clean. Very friendly. Good food. Highly recommended. - Guest feedback after a two night stay in one of our en suite double bedrooms. A wonderful place to stay. Great breakfast. 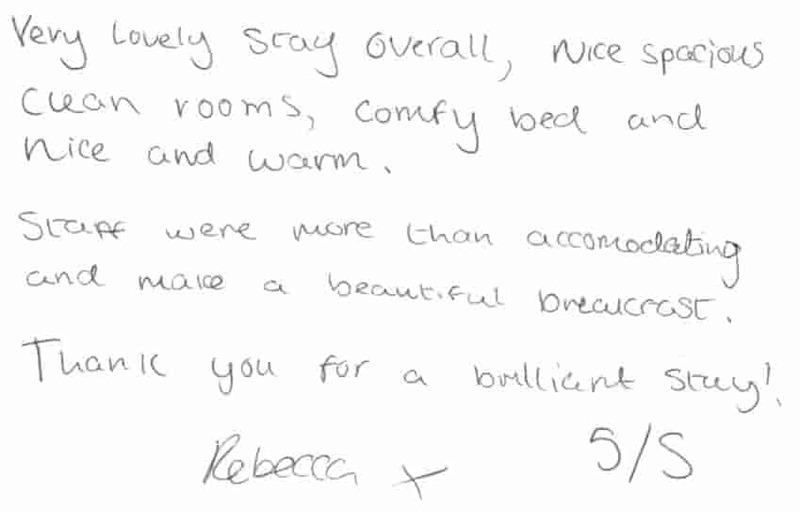 - Guest feedback after a stay in one of our standard single bedrooms. Very friendly, comfortable a excellent breakfast. Room was comfortable and had everything I needed during my stay. Breakfast was v good and the staff were very friendly and helpful. 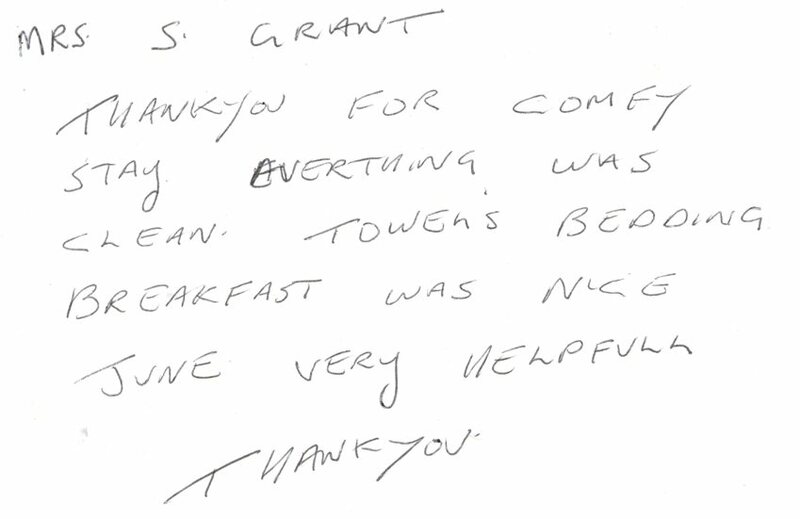 - Guest feedback after a five night stay with us whilst training at the nearby Marine Safety Training Centre. Warm welcome. Accommodation very comfortable. Food excellent. Staff very nice. Will recommend to all. 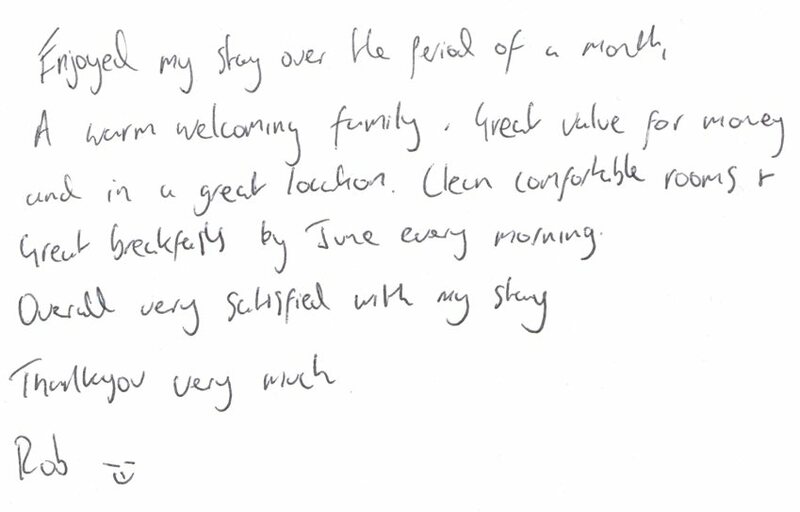 Guest feedback after a five night stay in one of our standard single bedrooms. Thanks for a lovely stay, the bedroom and en suite was lovely and comfortable. 10 out 10 for cleanliness. Our breakfast was lovely and the lady made us very welcome. 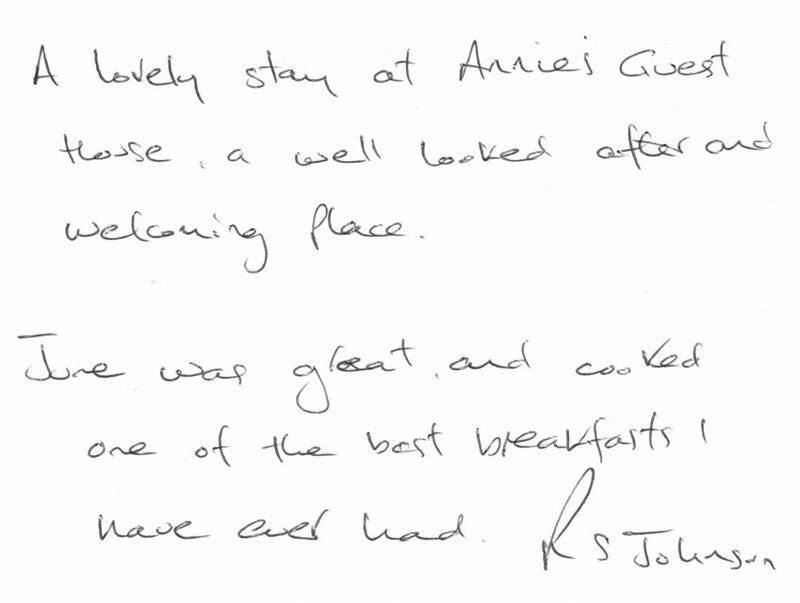 We will definitely recommend Annie's B&B and will be back. 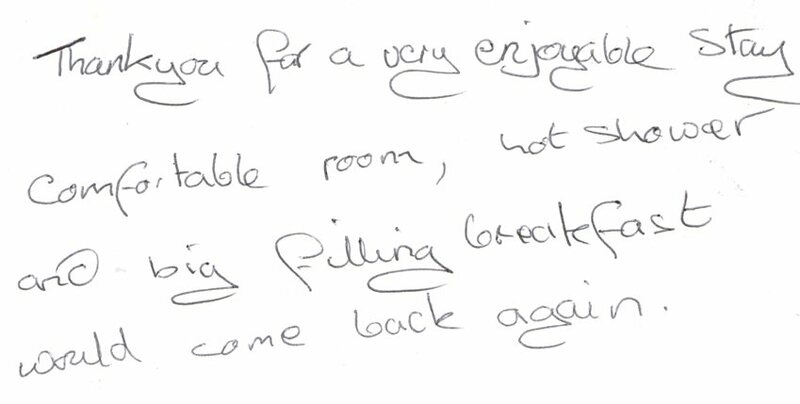 Guest feedback after a two night stay in one of our en suite double bedrooms. Really enjoyed the week stay. Peaceful. Clean & tidy. Gorgeous bathroom! Breakfast was always delicious and prompt. Staff are lovely and friendly. Would definitely stay again. Thank you. I loved it, the breakfast was amazing and the eggs stayed together. Memory foam mattresses and wifi. Not too much to ask. Lovely people. June was very nice and kept us company at breakfast. Bathroom was huge and rubber ducks for babies and a shower than can fit two people. I enjoyed staying here as it was a nice, quiet, cheap and cheerful place and would highly recommend this to anyone. I was very happy with the room itself, comfy bed and there was a lot of refreshments which we were able to choose from. The staff were also very welcoming and did a great job in showing us everything etc. Excellent venue. Fantastic room no problems at all 10/10 for breakfast and customer services would definitely stay again or recommend to friends. Thanks for a lovely night. Enjoyed my stay over the period of a month. A warm welcoming family. Great value for money and in a great location. Clean comfortable rooms + great breakfasts by June every morning. Overall very satisfied with my stay. Thank you very much. 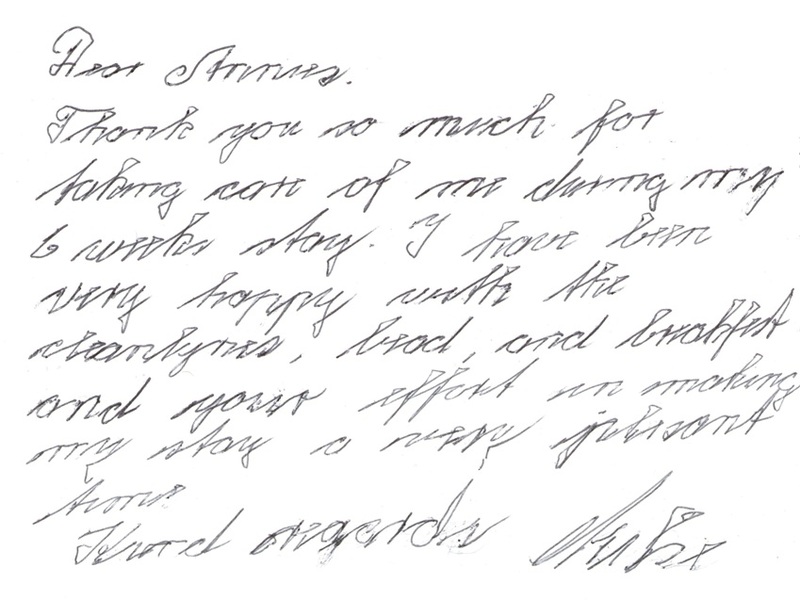 - Guest feedback after a month long stay with us whilst training at Maersk Newcastle. Outstanding hospitality and incredible value for money when you consider the alternatives. Welcoming + personal, I would highly recommend to anyone. Kindest regards. - Guest feedback from a professional photographer who stayed with us whilst working in North Shields. 10#47;10 Wonderful place for a family break#33; The staff we kind and welcoming and were so helpful. My 5 & 7 year old were welcomed and made to feel very comfortable. The breakfast was amazing and the staff made you feel like nothing was too much trouble. The room was clean and comfortable and well supplied. It benefits from being a few minutes walk to the Marine Park and is only ten minutes walk from the fair and beach. Perfect. We really enjoyed our stay here. Both hosts are very kind. Breakfast was delicious and the bed was so comfortable. South Shields city centre with a mile of food (most of the time Indian restaurants) is nearby and so is the beach is a great recreational area. - Guest feedback from two German cyclists who stayed with us after their Scottish cycling holiday before taking the DFDS ferry from North Shields home. 9.2/10 Value and very quiet location ten mins from beach. Nice breakfast, comfy room and delightful host. We had a really lovely stay. Everything was as we were expecting and would definitely stay again. Breakfast was delicious too. Thank you so much. 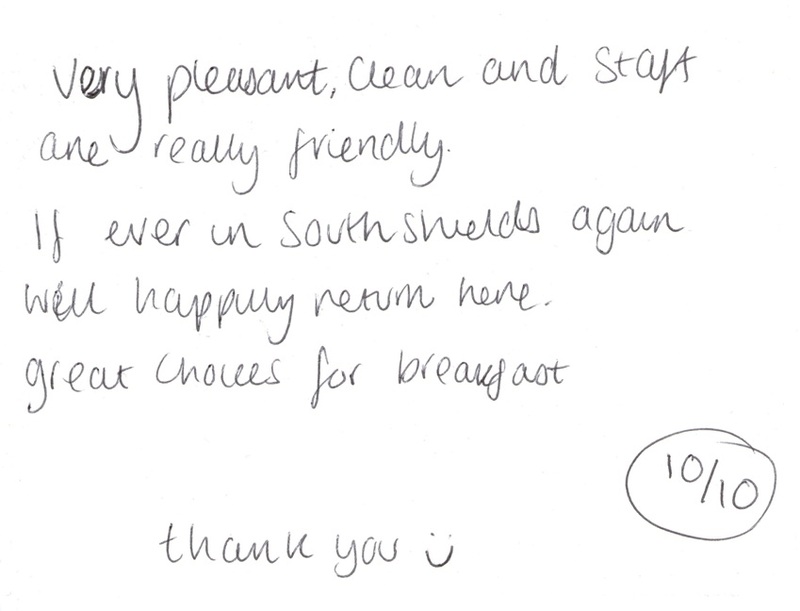 - Guest feedback from a family of seven who stayed with us attending a wedding at the Best Western Sea Hotel in South Shields at the bottom of our street. We really enjoyed our two night stay at Annie's Guest House. The breakfast was excellent and the room and shower/bathroom were very clean and comfortable. We were looked after by June who is a very pleasant and obliging host. Kind regards and many thanks. 10/10 Exceptional. Clean room, comfy bed, v nice breakfast. Allowed to stay 1/2 hour over checkout time. 1 Excellent B&B. 2 Very clean + tidy. 3 Very pleasant. 4 Would recommend to other people. 5 Food very good. 6 Good location. Excellent. Very comfortable stay. Fantastic breakfast. Will definitely recommend to others. 5* Fantastica Esperienza! Camere confortevoli e colazione deliziosa. Consigliato. Stayed for the Great North Run weekend and had a fantastic time, made the weekend stress free. Great location, very pleasant and welcoming staff. Thank you. - Feedback from a family of four who have been staying with us for the Great North Run weekend for the past three years. Thank you for comfy stay everything was clean. Towels, bedding. Breakfast was nice. Juse very helpful. Thank you. 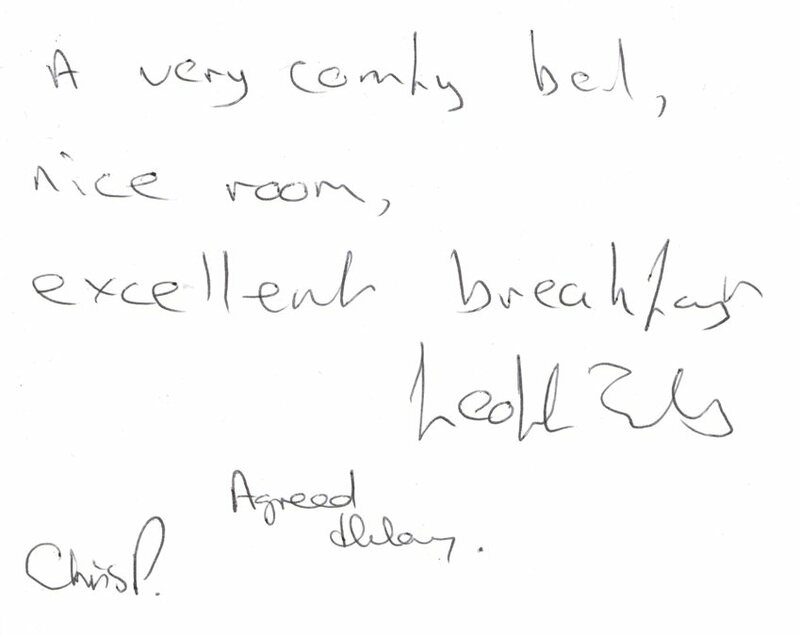 - Guest feedback after a stay in one of our en suite double bedrooms. 10/10 A+ Only in the area one night. Being allowed to bring food and drink inside the room. This was absolutely a great experience. June was a very friendly hostess. The bed was very comft. We slept well and feel refreshed amd ready to continue our trip to Scotland. We would recommend "Annie's" to friends. 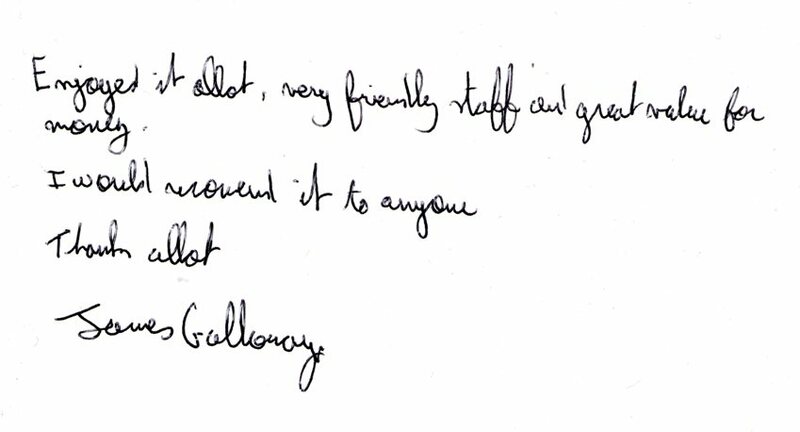 - Guest feedback from two American couples who stayed with us en route to Scotland. 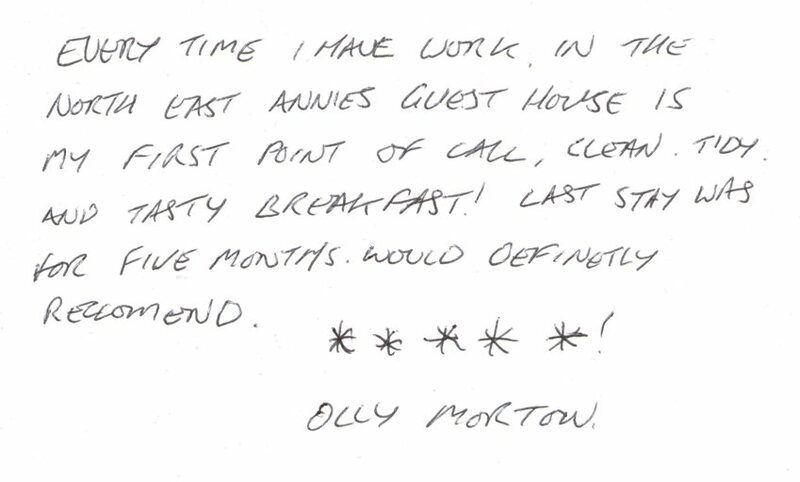 - Guest feedback from a solo guest who stayed with us for five nights whilst studyinge at South Tyneside College. Fantastic sleep. Clean & tidy love those foam mattresses. Best sleep in long time. Going home to buy 1. Hehe thank you. Excellent. 10/10 Brilliant. Smashing place to stay. Comfy and cozy. Great breakfast. - Guest feedback after a three night stay in one of our standard single bedrooms. I resided here in Annie's Guest House for four days and during my stay I was treated with utmost care. The room was very clean and tidy. The breakfast was very good. I would recommend Annie's Guest House for family and friends. - Guest feedback after a four night stay in one of our standard single bedrooms attending a short course at South Tyneside College. Really good B+B. Comfy cosy and with a great breakfast. Handy for public transport. Very very good! - Guest feedback after a three night stay in one of our standard single bedrooms to watch the cricket at Emirates Riverside Cricket Ground in Chester-le-Street. 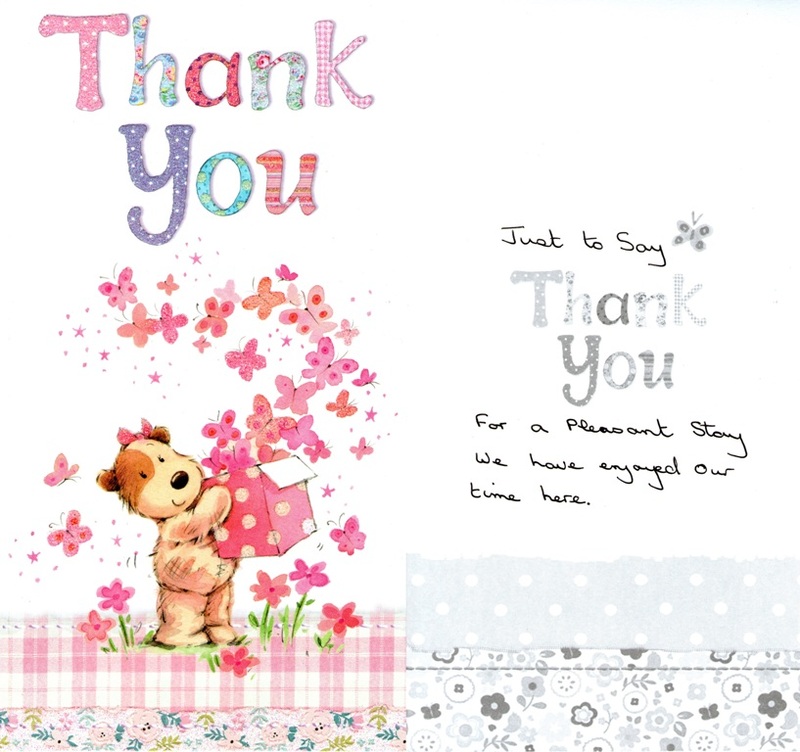 - Lovely thank you card received after a three night stay in one of our en suite triple bedrooms. Rooms are immaculate! Very friendly and efficient service. 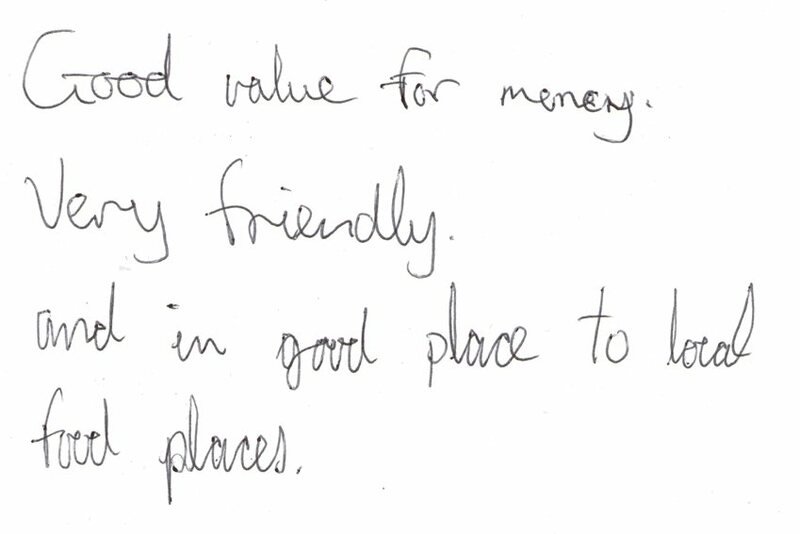 - Comments from a guest who stayed in one of our en suite double bedrooms, visiting South Shields to attend a funeral. 5* Lovely guest house with really comfy beds and great WiFi, which is an essential these days especially for my other half! It's in a fantastic location. Great warm, friendly and welcoming service from the lovely owners. Brilliant food too! Great little find! Thank you so much for a great stay, we had a great time. 5* Awesome service. Thank you so so so so so so so so much! Thank you June for looking after us - such wonderful hospitality. I have absolutely nothing negative to say. A wonderful welcome - beautifully comfortable rooms - extremely clean - relaxed atmosphere - Amazing breakfast and you June, an absolute treasure. A pleasure to meet you. Thank you for a very lovely stay. Very friendly + welcoming. Egg-cellent breakfast. Comfy bed. Thank you. 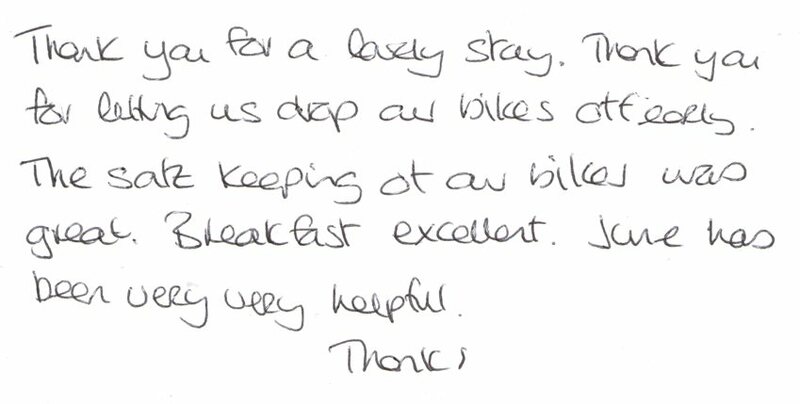 - Feedback from a group of eight cyclists who stayed with us for two nights after completing the C2C cycle route. 5* Enjoyed our stay here, very clean and comfortable, recommend a walk on the beach. Ich hatte eine gute zeit hier. - Comments from a German guest who stayed with us for fifteen nights whilst working at the Nissan car factory in Sunderland. 5* Great value & family-friendly B&B in South Shields. Room was very warm although fan was provided. Staff were very helpful and friendly. Room and facilities were spotless. - Online review from a family of four who stayed in our standard quadruple roon for two nights. I'm afraid there's no negative things to tell. It was very nice staying here. Been a great help and you are very friendly. Thank you! - Feedback from a family of four from The Netherlands who stayed with us at the end of their UK cycling holiday. - Online review from a guest who stayed with us visiting South Shields Sailing Club. Excellent stay, stayed a couple of times, never had a cause to complain. Very welcoming and helpful. Ideal for our stop over on our cycle tour. 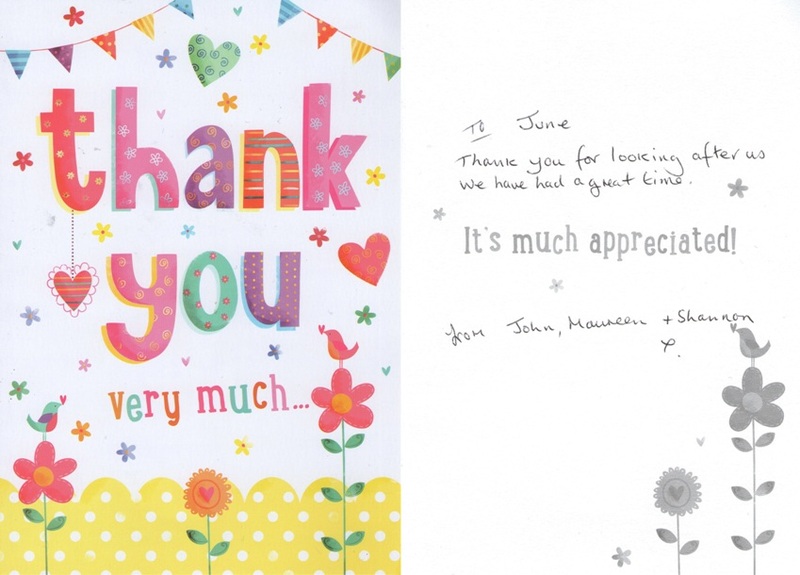 - Feedback from two cyclists who stayed with us on their East Coast cycle tour. Made to feel most welcome by June and the breakfast was lovely. Like the memory foam beds. Stayed for weekend, very pleasant, clean, very friendly 10/10 for a full English breakfast. Well done June lovely lady. Would stay again. 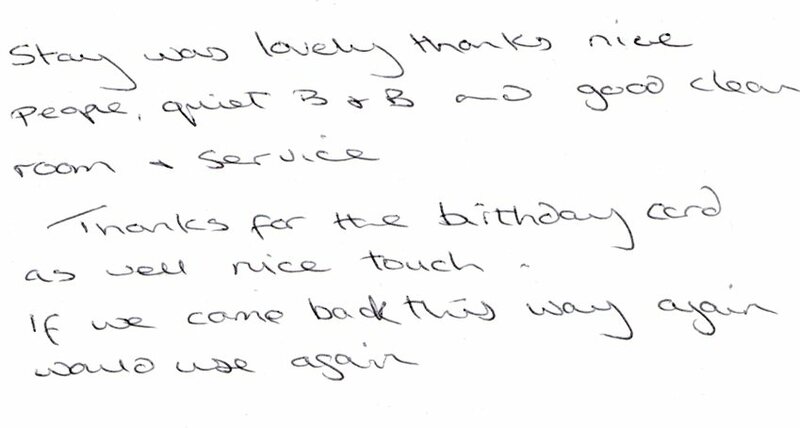 - Feedback from four guests who occupied our standard twin bedroom and an en suite double bedroom, attending an 18th birthday party in Hebburn. A lovely stay in a clean and well maintained place so close to the sea and the famous Ocean Road stretch of restaurants. June was so welcoming and her breakfasts were to die for - she even got me some special Vegan sausages! Highly recommended! 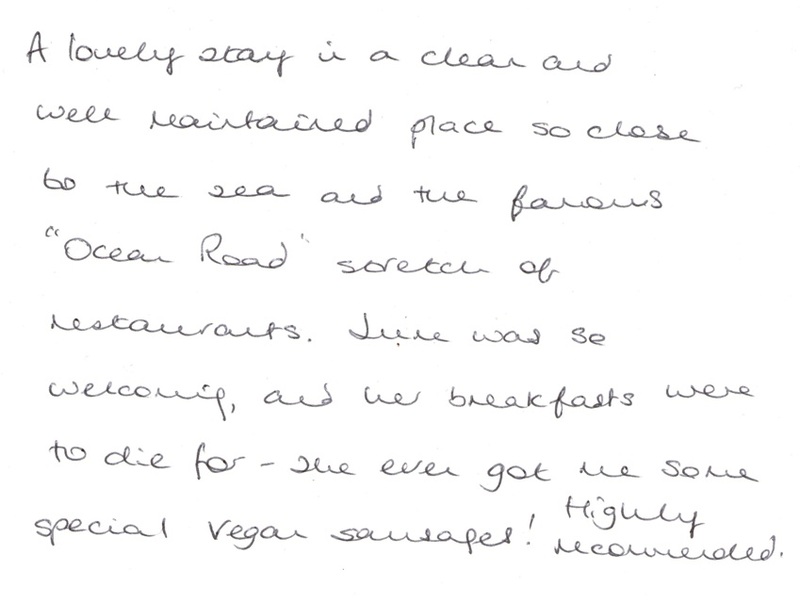 - Guest feedback from a Vegan and gluten-free mother and daughter after a stay in one of our en suite twin bedrooms before joining the Balmoral cruise ship for a 14 night 'Wonders of Spitsbergen' Norwegian cruise from Port of Tyne. Very friendly and lovely place to stay at Annie's Guest House. 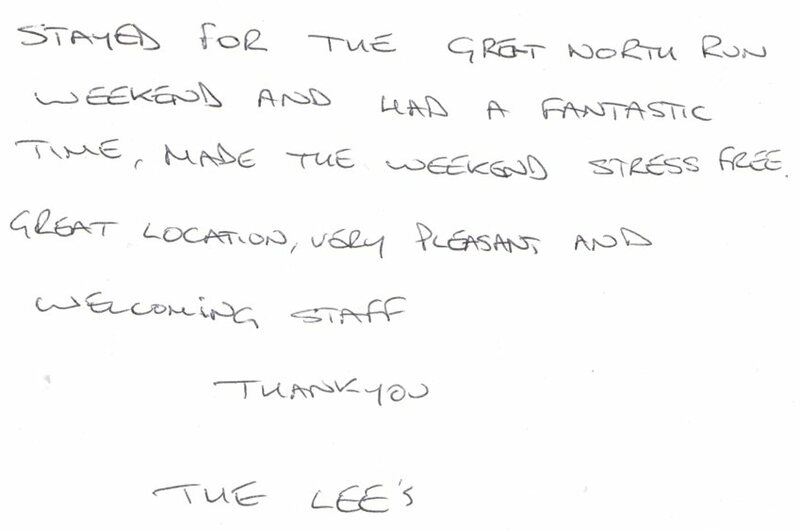 - Guest feedback after a two night stay in one of our en suite triple bedrooms whilst visiting Mouth Of The Tyne Festival. 5* Great value hotel with fast wifi. I really liked how the breakfast was made fresh. Will be making another booking soon. 5* Great stay, close to beach and town. Short journey to Newcastle Central. I'll be back again next month. 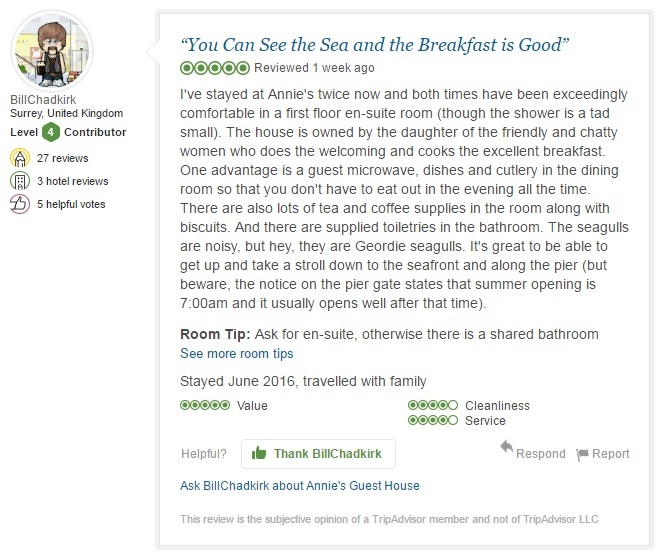 - Online review after a six night stay with us. Beds with memory foam super comfy, breakfast substantial. We've had a lovely stay here. A warm welcome, delicious vegetarian breakfast and great facilities! - Feedback from two Belgian cyclists who stayed with us for two nights before catching the DFDS ferry from Port of Tyne to IJmuiden. Spotlessly clean, freshly cooked food, extremely helpful. Our favourite B&B of our C2C trip! 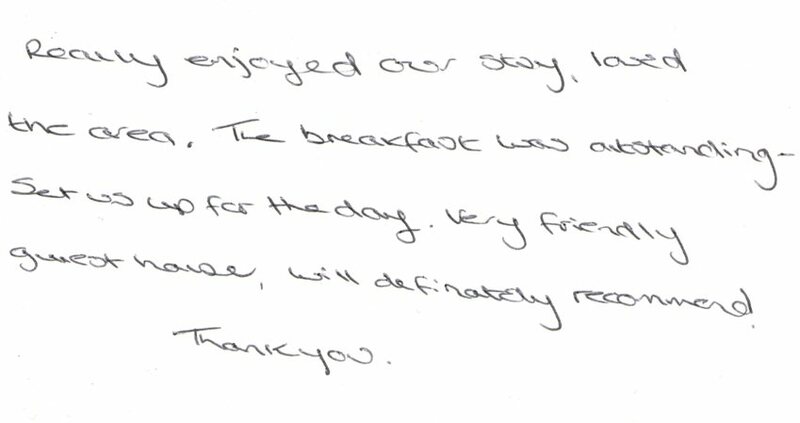 - Feedback from three guests who stayed with us before and after completing the C2C cycle route. Stayed for one night after watching the South Shields parade. Nice and clean with everything you need for a comfortable stay. Rooms are spacious with memory foam beds and a flat screen tv. Staff were lovely and helpful. 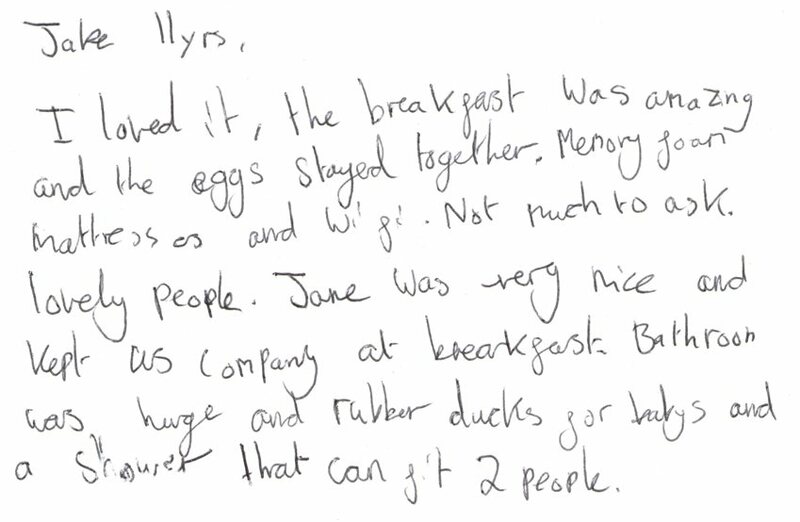 - Guest feedback from a family of four who stayed in our standard quadruple room. 10/10 Service with a smile. Superb value for money, fast wifi. Room 6. Very nice/comfortable room, friendly service, enjoyable stay. 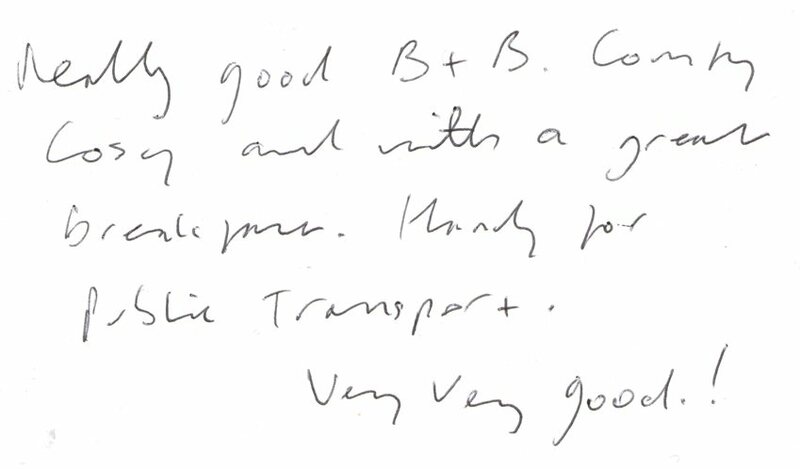 - Feedback from a repeat guest who stayed with us after completing the C2C cycle route. 10/10 A great place to stay in South Shields. Thanks very much for a perfect stay. Everything spotless comfortable beds and perfect breakfast. Best wishes. 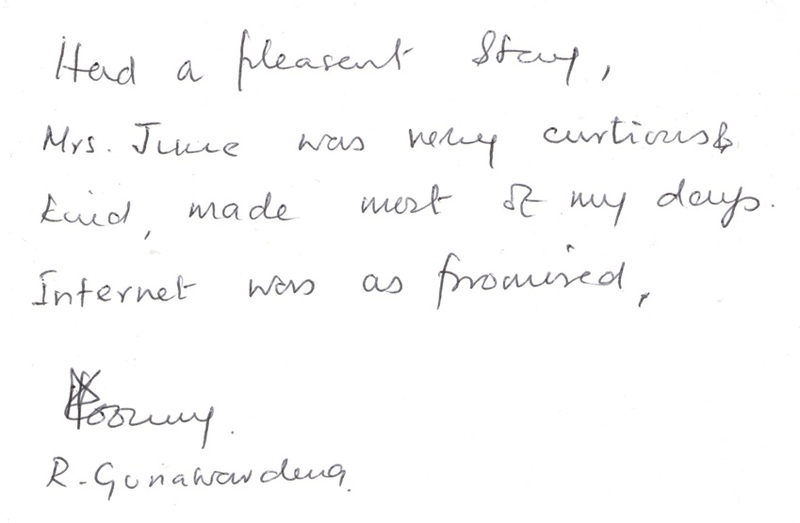 - Guest feedback after a two night stay whilst visiting Beamish Museum. 8.8/10 Excellent value for money. - Online review after a one night stay in our standard twin bedroom whilst working at a local school. I've stayed at Annie's twice now and both times have been exceedingly comfortable in a first floor en-suite room (though the shower is a tad small). The house is owned by the daughter of the friendly and chatty women who does the welcoming and cooks the excellent breakfast. One advantage is a guest microwave, dishes and cutlery in the dining room so that you don't have to eat out in the evening all the time. There are also lots of tea and coffee supplies in the room along with biscuits. And there are supplied toiletries in the bathroom. The seagulls are noisy, but hey, they are Geordie seagulls. It's great to be able to get up and take a stroll down to the seafront and along the pier (but beware, the notice on the pier gate states that summer opening is 7:00am and it usually opens well after that time). Ask for en-suite, otherwise there is a shared bathroom. 6.3/10 Breakfast was good. Staff was cordial. - Online review from a Sri Lankan guest who stayed with us for five nights whilst studying at South Tyneside College. We have enjoyed our stay in this very friendly guest house. It was so useful to be able use a microwave in the evening - kept our costs down! Thank you. 5* Enjoyed our stay here a lot. Welcoming, family-friendly and good value accommodation. A lovely stay, all the staff very helpful, breakfast was very nice and all we requested and a prompt service, in all everything that we had chosen online. 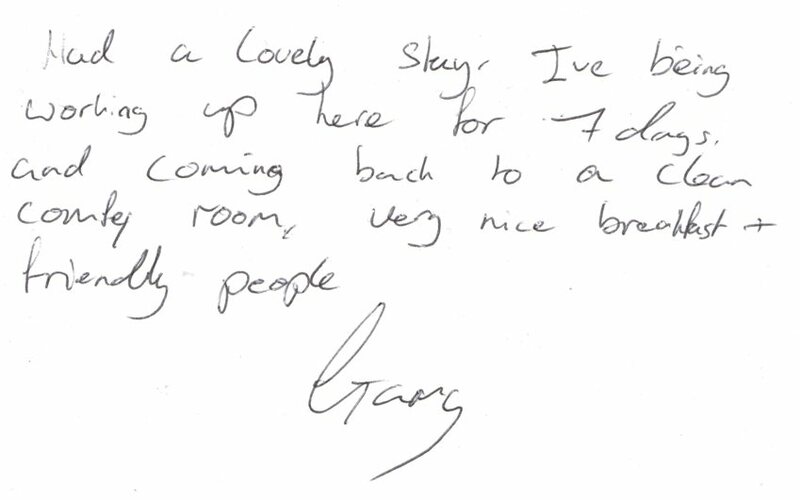 - Feedback from guests who stayed with us for two nights in one of our standard double bedrooms, attending a wedding at South Tyneside Registry Office. Had a pleasant stay, Mrs June was very courteous & kind, made most of my days. Internet was as promised. 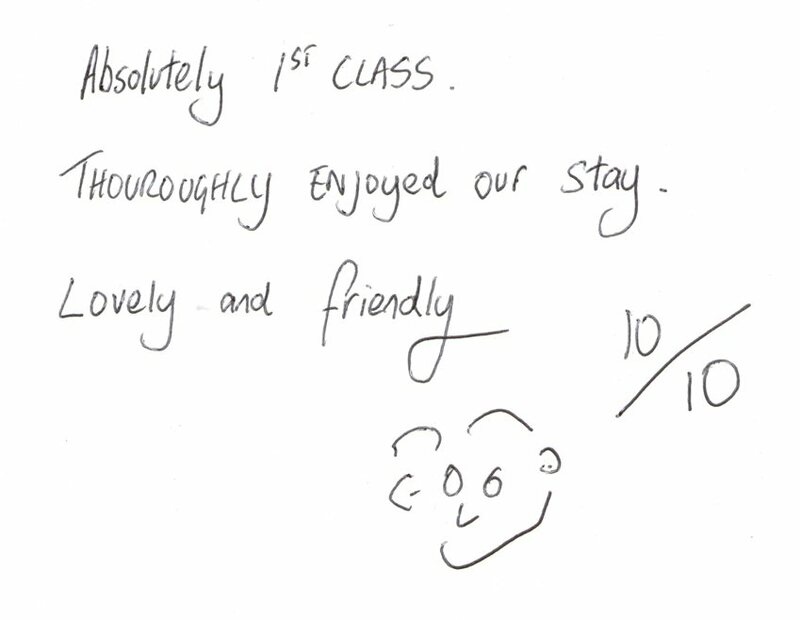 - Feedback from a Sri Lankan guest who stayed with us for five nights whilst studying at South Tyneside College. Most excellent B&B. Nice rooms, really good friendly staff. - Feedback after a one night stay in one of our standard double bedrooms before catching the DFDS ferry from the International Ferry Terminal at Port of Tyne in North Shields to Amsterdam. Secure, nice beds, hot showers, clean, nice town. What more could you ask for	? - Feedback after a three night stay in one of our en suite double bedrooms, attending a wedding reception at Dunes on Sea Road - at the bottom of our street. . I've had a great three week stay here, you have all made it very comfortable and warming for me. I will definitely stay here again if I am in South Shields again. Breakfast is yummy and I found everything nice & clean. Staff are all lovely too! Many thanks. 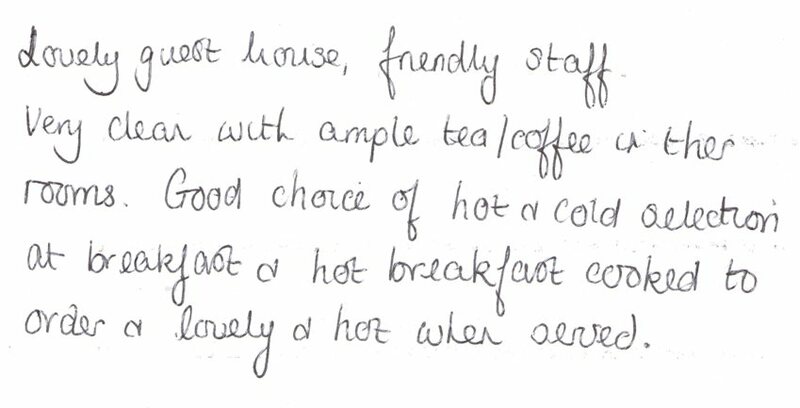 - Feedback from a guest who stayed with us for three weeks whilst working at South Tyneside Hospital. Thank you for a lovely stay. Thank you for letting us drop our bikes off early. The safe keeping of our bikes was great. Breakfast excellent. June has been very very helpful. Thanks. - Feedback from two cyclists who stayed in one of our en suite twin bedrooms before embarking upon the Coast & Castles cycle route up to Edinburgh (NCN Route 1). Dear Annie. Many, many thanks for the wonderful stay. Everything was perfect. So homely. We would have no doubts in recommending to friends. Best wishes. - Feedback after a stay in one of our en suite double bedrooms before joining cruise ship the Balmoral for a ten night cruise from Port of Tyne. Very pleasant stay so quiet, staff friendly, breakfast brilliant, very clean and tidy would recommmend to others and we will be back. 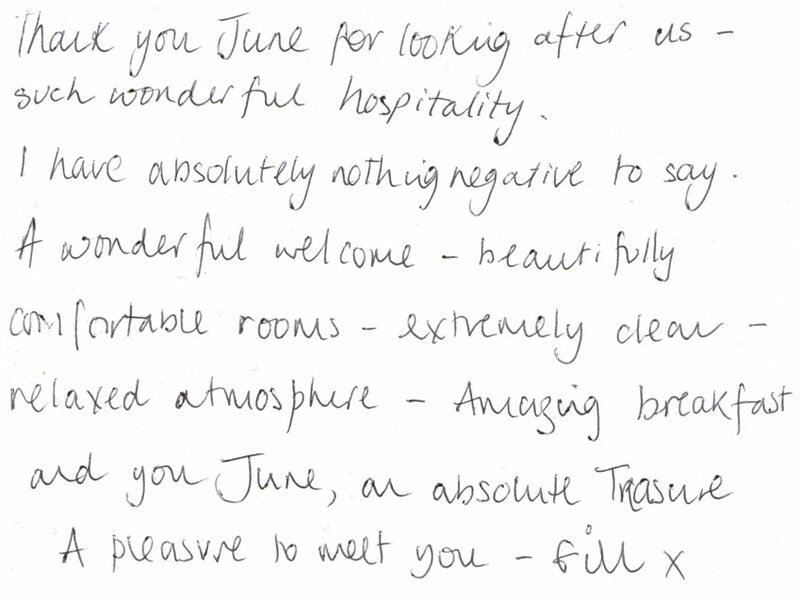 - Feedback after a stay in one of our standard double bedrooms. 9.2/10 Very hospitable and friendly. - Online review after a two night stay in one of our standard double bedrooms. 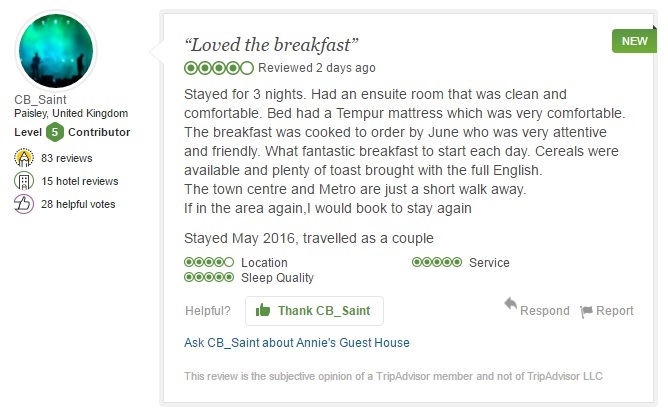 - Online review after a two night stay in our standard twin bedroom. A very clean, comfotable and friendly place at good prices. No complaints at all. Thank you I will recommend you to others. A lovely stay, friendly & helpful. Great breakfast. Spacious room with good facilities. Definitely would stay here again. Comfortable accommodation, quality breakfast, delightful staff. Thanks very much! - Feedback from guests from New York, USA after a stay in one of our en suite twin bedrooms. 5* 30/30. It was great to be offered veggie sausages for breakfast and my tired muscles loved the big bubbly bath. - Theatre Digs Booker guest review after a three night stay with us whilst performing at The Customs House theatre in South Shields. Lovely guest house, friendly staff. Very clean with ample tea/coffee in the rooms. Good choice of hot & cold selection at breakfast & hot breakfast cooked to order & lovely & hot when served. 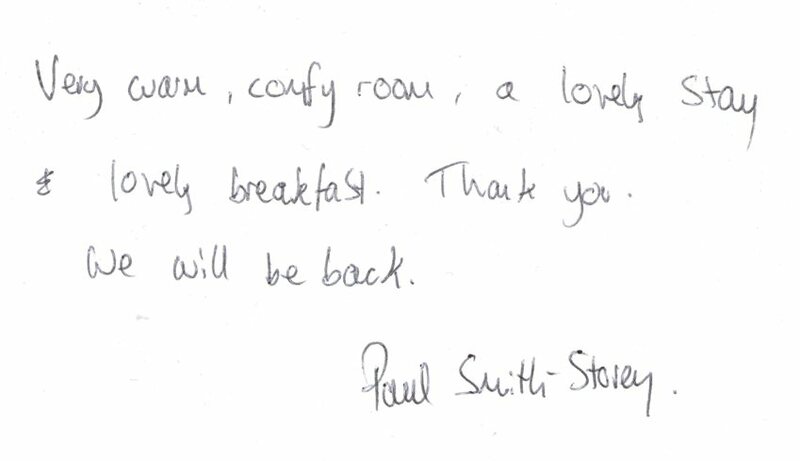 - Guest feedback after a two night stay in our standard twin room. 10/10 Exceptional. Good location and plenty of parking available and helpful staff. - Online review after a four night stay in one of our en suite double bedrooms. Fandabbydosey!! Very welcoming friendly atmosphere. Clean, tidy and comfortable. Home away from home. Staff very helpful. Excellent breakfast. Clean & tidy. Excellent value for money. Would stay again. 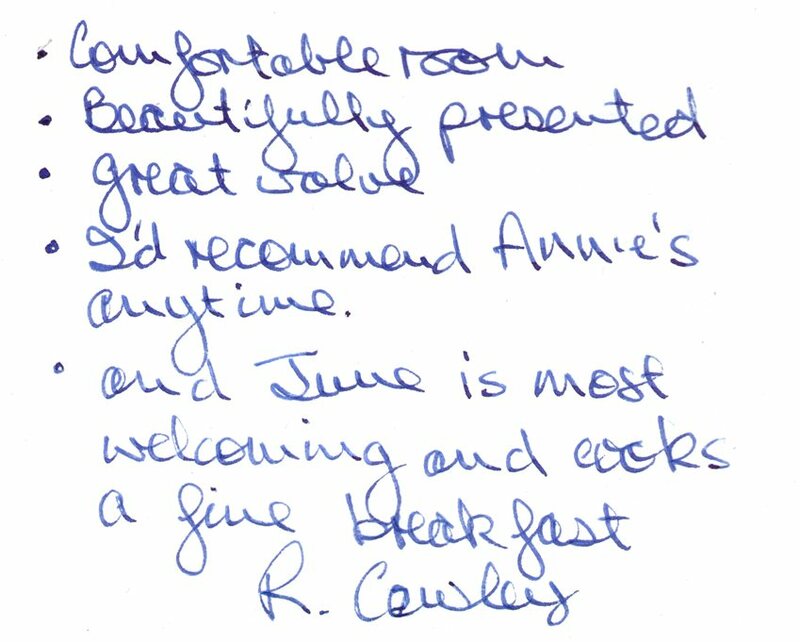 Comfortable room, beautifully presented, great value, I'd recommend Annie's any time and June is most welcoming and cooks a fine breakfast. - Guest feedback after a two night stay in one of our standard double bedrooms. It was very nice to have veggie sausages and the bath is great after a heavy day. 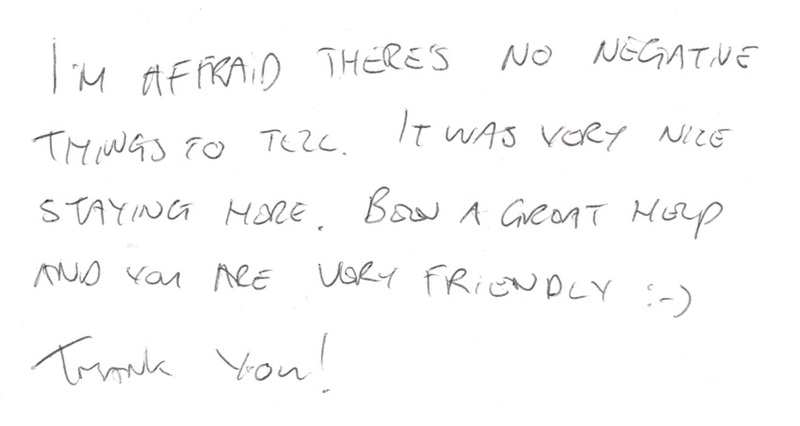 - Guest feedback after a three night stay whilst working/performing at The Customs House theatre in South Shields. Loved staying here! Very clean, nothing was too much trouble and the food was always tasty. Would definitely recommend and stay again. Great value for money. 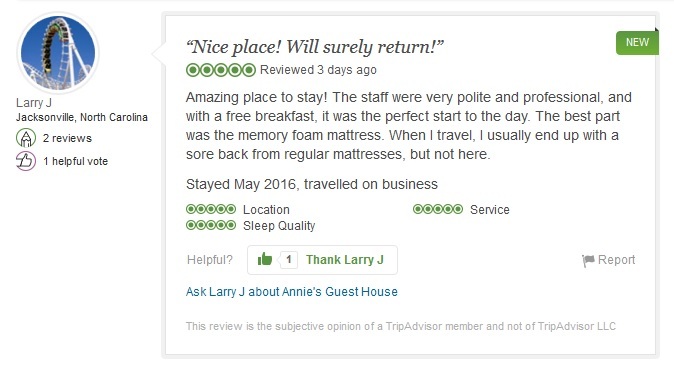 - Guest feedback after an eight night stay with us. 10/10 Annie's. Very satisfied with the stay. 10/10 Fab B&B. Lovely and clean, great staff, breakfast cooked to order, flexible check-in hours. 6.3/10 Unusually generous quantity of hot drinks supplies. Excellent wifi. Big wardrobe and decent sized table. The ladies worked very hard to cope with the bank holiday crush. I really liked the film posters on the walls, a refreshing change from usual B&B decor. Instead of having a key all the doors have number locks and each guest is given an individual code based on their phone number, which I think is a really good system. 10/10 Exceptional. Only there for one night. Breakfast was cooked just right and no fat on the plate... just how I like it. Even though you are next to a road it was very quiet at night. 10/10 Exceptional. Friendly staff and value for money with a cracking breakfast. Thank you for a very enjoyable stay. Comfortable room, hot shower and big filling breakfast. Would come back again. - Guest feedback from two couples who stayed with us before joining their eleven night Fred Olsen Icelandic Wildlife, Falls & Hot Springs cruise on the Balmoral departing Port of Tyne. Visited 'Annie's' twice now and never been disappointed. Beautifully kept and the breakfast is second to non. Jean is a friendly and helpful lady and a true assett to 'Annie's'. 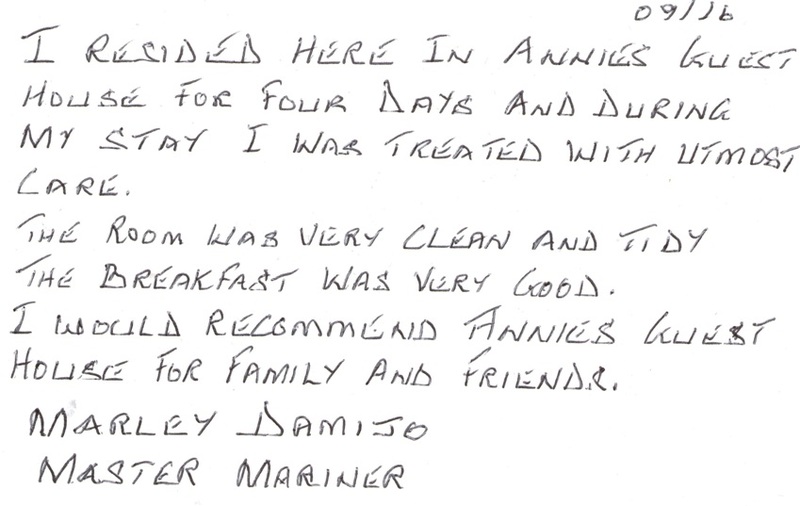 Also the cleaner and housekeeper is to be praised for her dedication to keeping 'Annie's' clean and fresh. Well done! Stayed for 3 nights. Had an ensuite room that was clean and comfortable. Bed had a Tempur mattress which was very comfortable. The breakfast was cooked to order by June who was very attentive and friendly. What fantastic breakfast to start each day. Cereals were available and plenty of toast brought with the full English. The town centre and Metro are just a short walk away. If in the area again, I would book to stay again. Only here for one night, would definitely come back. Good location for transport and very quiet at night to ensure a sound sleep. Place very clean and Annie does a good dry up and also helpful with advice getting around. Rooms have a kettle with tea/coffee so when you arrive you can make yourself a cuppa. 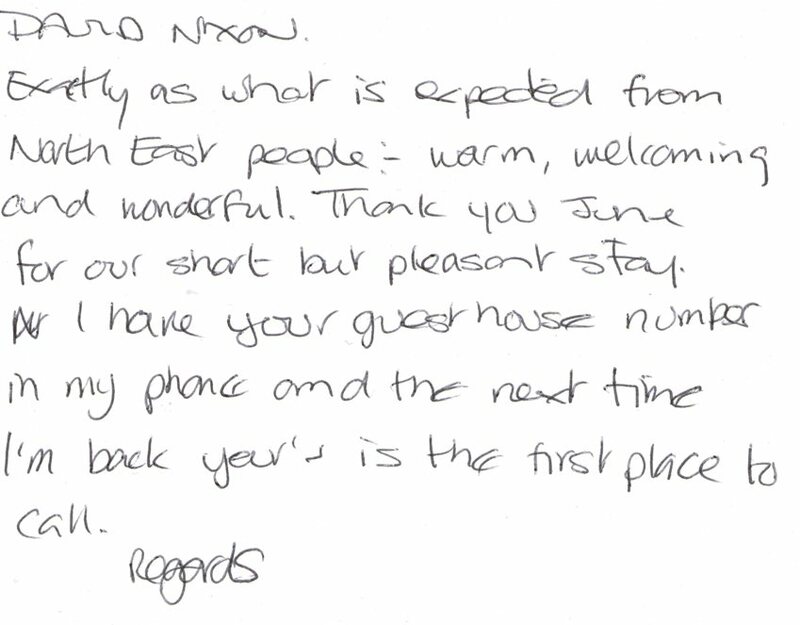 - Feedback from a guest who stayed in one of our standard single bedrooms whilst visiting Sunderland. Stayed one night for the England game vs. Australia in Sunderland. Great location, clean rooms and a fantastic breakfast. Would definitely stay again if I was in the area and June was lovely! 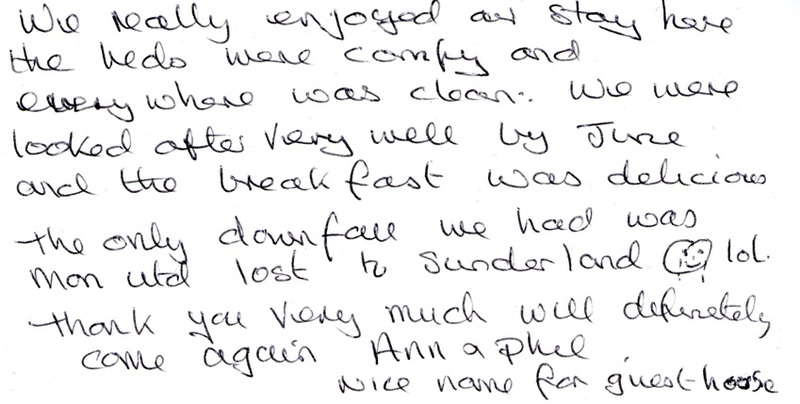 - Feedback from guests visiting the Stadium of Light in Sunderland. Fantastic stay. Very impressed with the decor, and the breakfast (black pudding!) Brilliant stay. Very happy to come again. 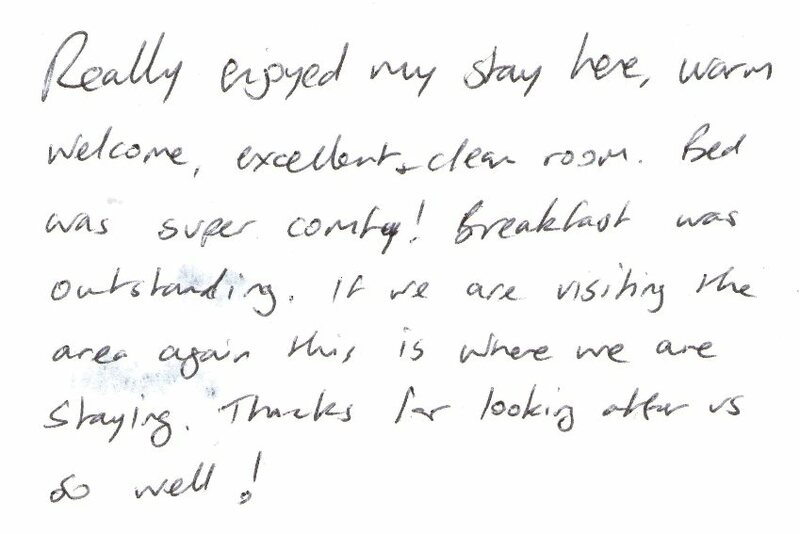 - Guest feedback after staying in one of our standard single bedrooms. Nice place! Will surely return! Amazing place to stay! 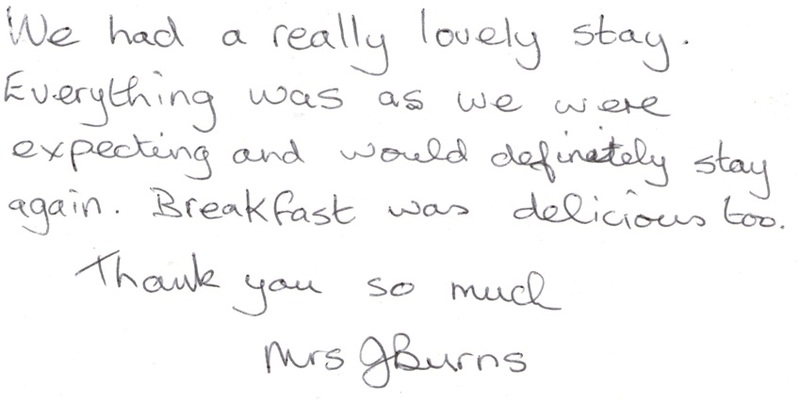 The staff were very polite and professional, and with a free breakfast, it was the perfect start to the day. The best part was the memory foam mattress. When I travel, I usually end up with a sore back from regular mattresses, but not here. 9.2/10 Superb. Very very friendly staff always there to help. Very comfy room. 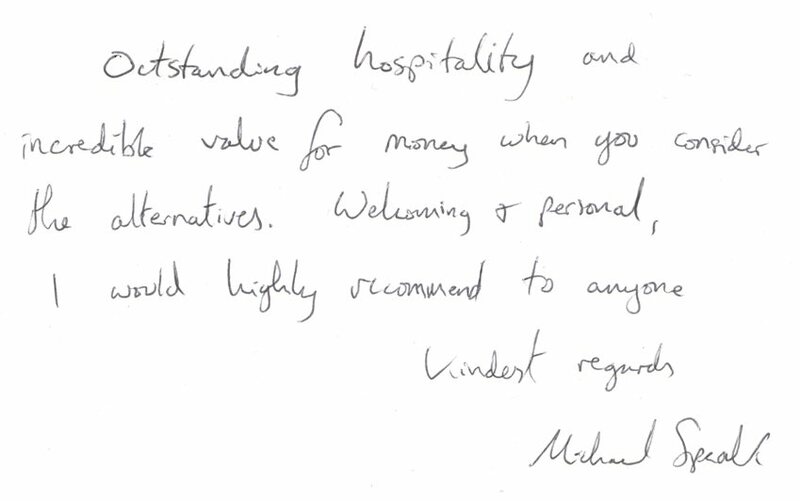 - Feedback from a German guest who stayed in one of our standard double bedrooms. Thanks for a great stay. Really appreciated your assistance in sorting the wrong dates out on Booking.com. I'll give you a review online too. 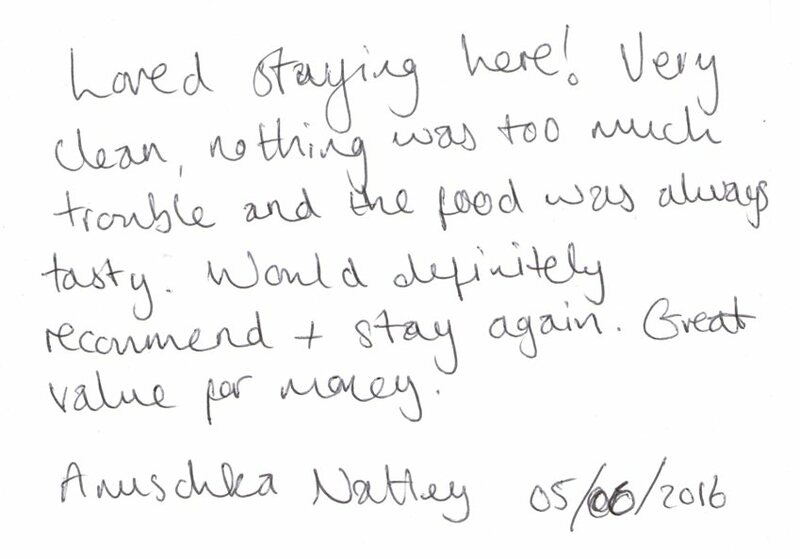 - Feedback from guests who stayed in one of our standard double bedrooms. Really enjoyed my stay here, warm welcome, excellent, clean room. Bed was super comfy! Breakfast was outstanding. If we are viiting the area area this is where we are staying. Thanks for looking after us so well! - Feedback from guests who stayed for three nights in one of our en suite double bedrooms whilst visiting St James' Park in Newcastle upon Tyne. Very clean premises, comfortable room and large bathroom. Very warm welcome and excellent breakfast. 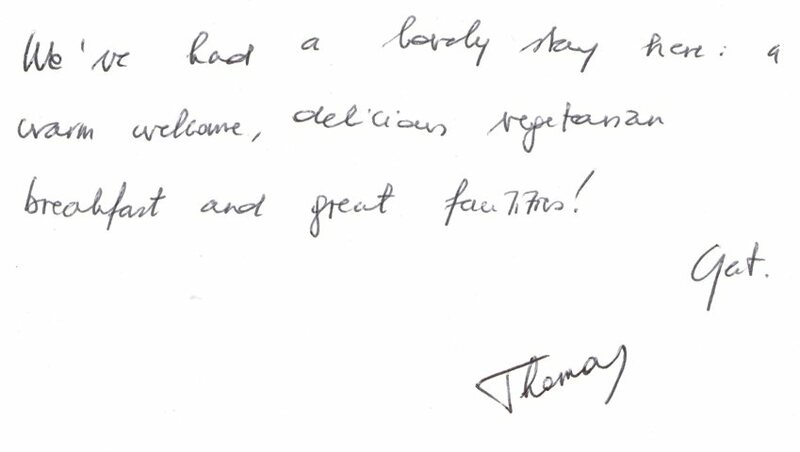 - Feedback from a couple from Paris, France who stayed with us for four nights. A very comfy bed, nice room, excellent breakfast. 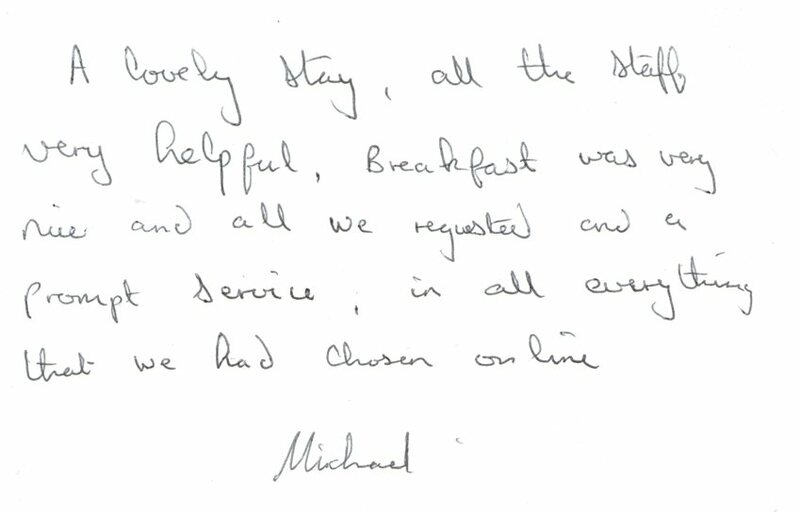 - Feedback from five guests who stayed with us before embarking upon Hadrian's Cycleway. 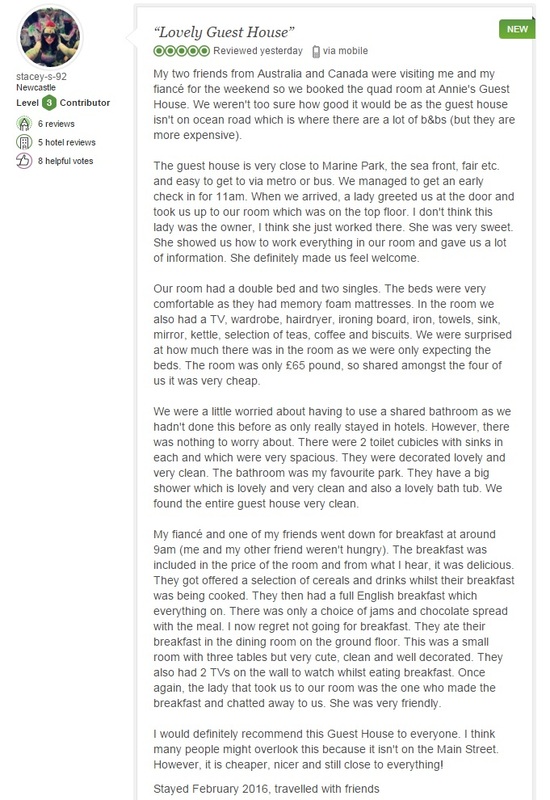 - Online review from an Australian guest who stayed in one of our en suite twin bedrooms for three nights. Another great stay at Annie's B&B. See you next month. Many thanks. 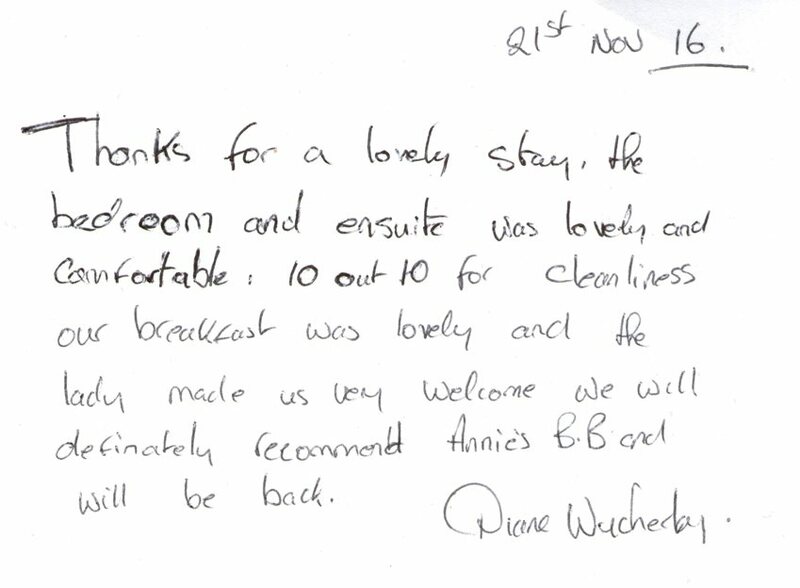 - Feedback from one of our regular guests. Really enjoyed our stay, loved the area. The breakfast was outstanding - set us up for the day. Very friendly guest house will definitely recommend. Thank you. 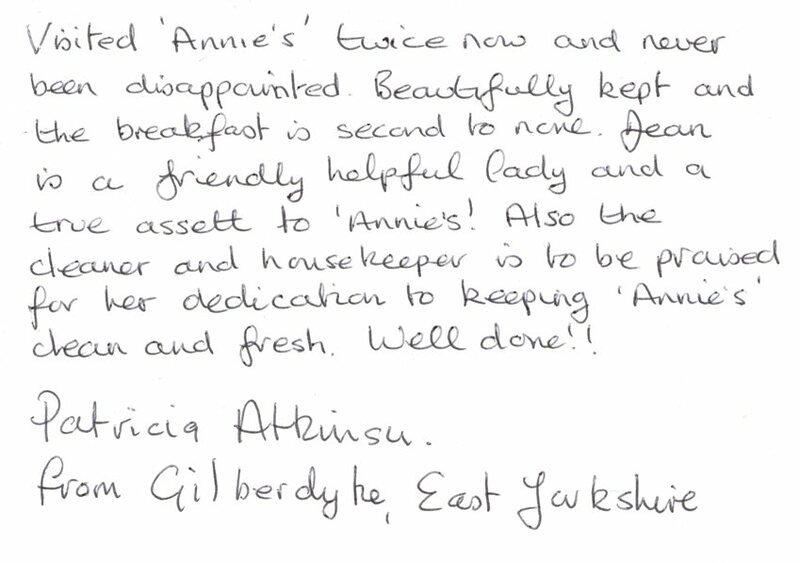 - Feedback from guests after a two night stay in one of our en suite double bedrooms whilst visiting Beamish Museum. 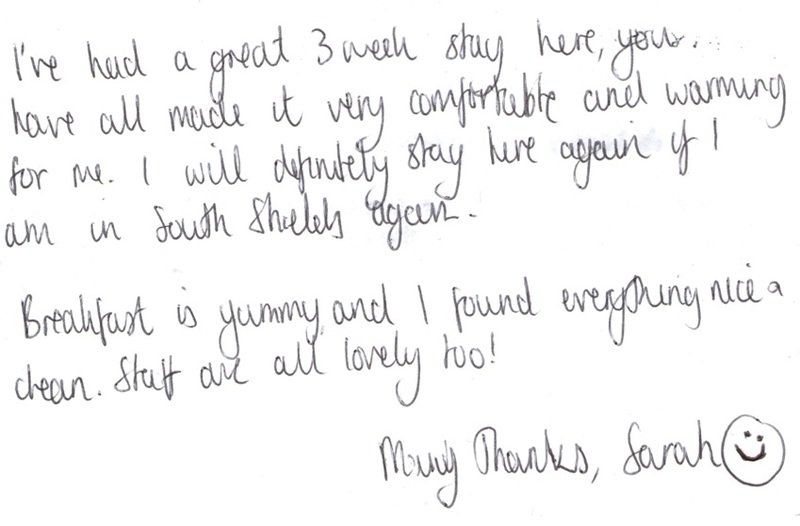 - Review from a guest who stayed with us whilst studying at South Tyneside College. Very enjoyable stay thanks no complaints. Room was clean and breakfast was good and staff friendly. - Guest feedback after a four night stay in one of our standard single bedrooms. Room 2. Lovely clean, comfortable room and good breakfasts. Couldn't ask for better! Will be back next time I'm in Shields. 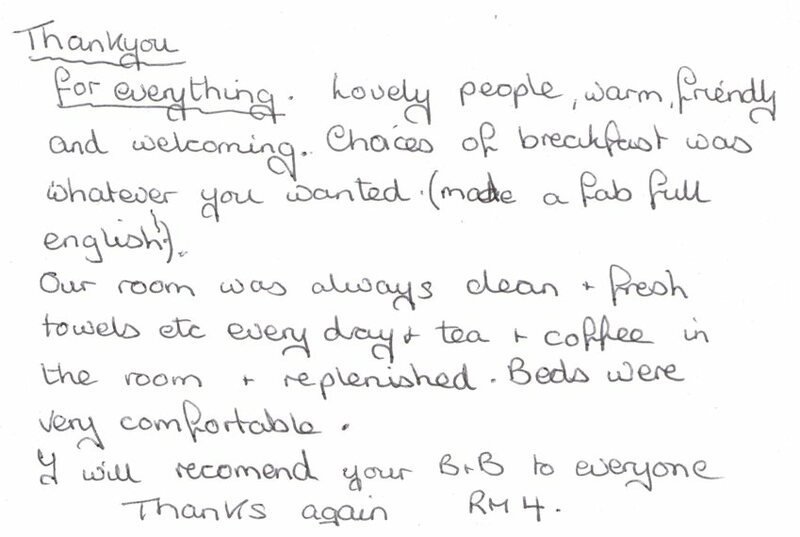 - Guest feedback after a four night stay in our standard quadruple room. - Guest feedback after a four night stay with us. Stayed for four weeks. Best B&B I've stayed in by far. Couldn't recommend enough. 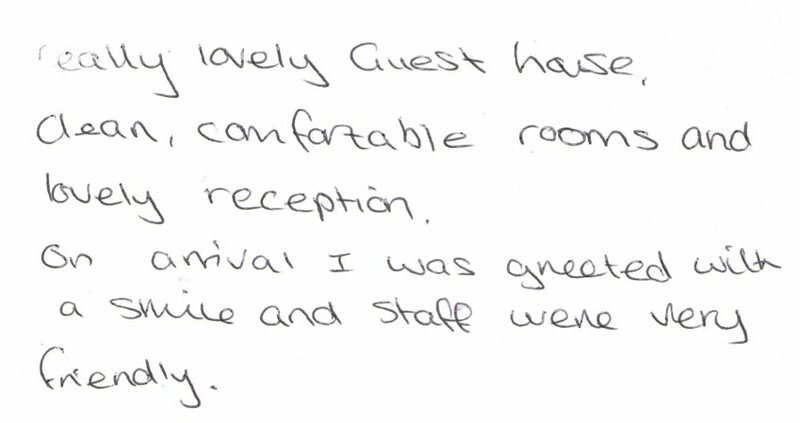 - Guest feedback from a guest who stayed with us for a month whilst studying at South Tyneside College. 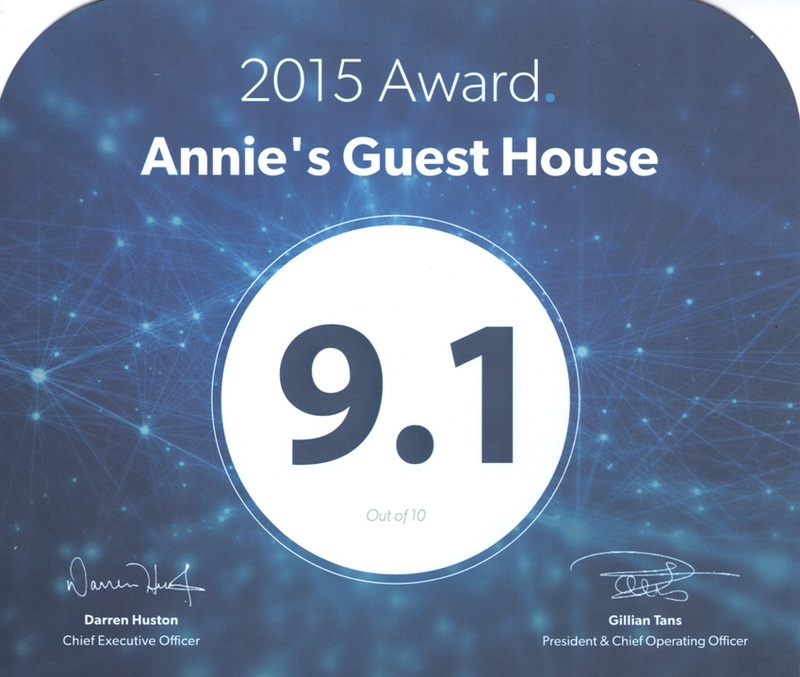 I've stayed in many but Annie's is the best guest house I have stayed for a very long time. - Guest feedback after a four night stay in one of our en suite twin bedrooms. Lovely stay at Annie's Guest House. A well looked after and welcoming place. June was great and cooked one of the best breakfasts I have ever had. - Feedback from a family of three who stayed with us to attend their son's graduation ceremony at South Tyneside College. Good food, comfy bed, nice room, will be back. Thank you!!! 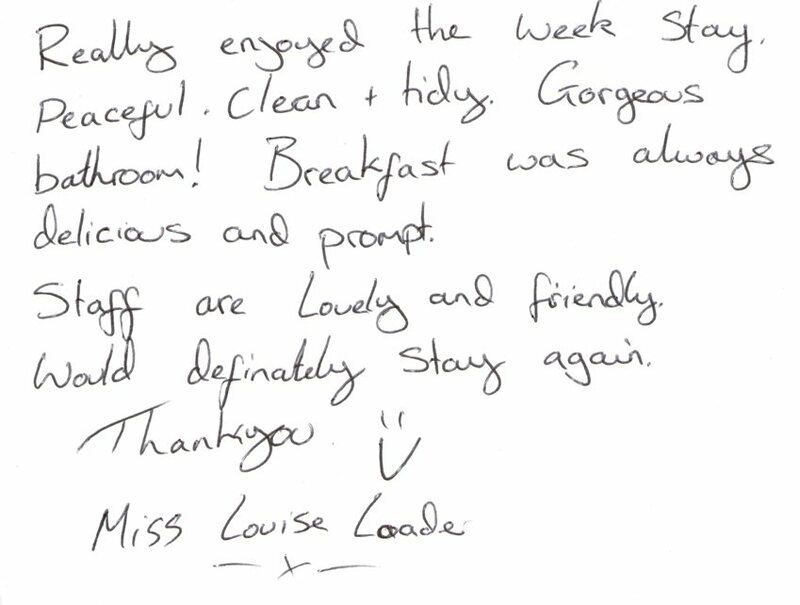 - Feedback after a three night stay in one of our standard double bedrooms. 5* We really enjoyed our stay here. It was very clean, quiet and all of our needs were met. I'd definitely recommendanyone to this spot and we will be using this place whenever we are in the area! - Online review from a guest who stayed in one of our standard single bedrooms for two nights. Lovely stay, perfect for work. Very cost effective, very friendly, very efficient, very comfortable. Would happily recommend. 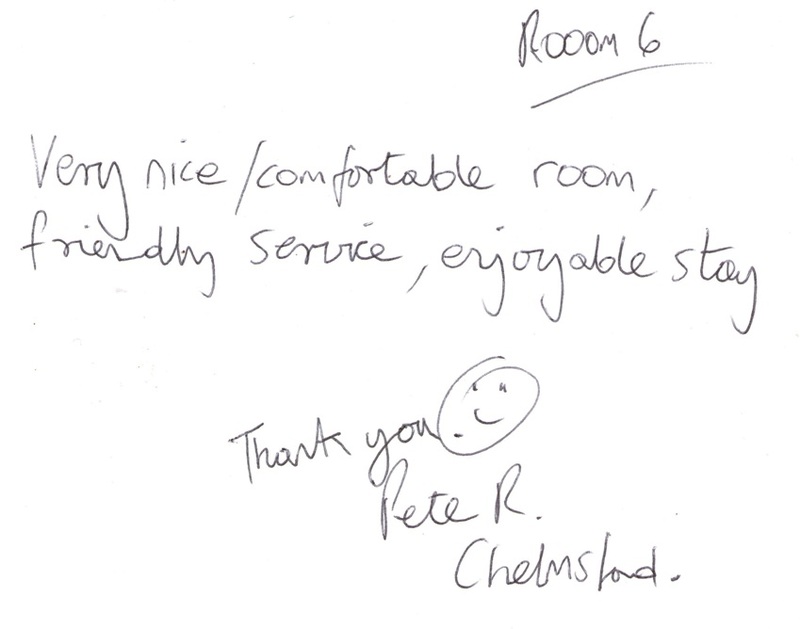 - Feedback from a guest who stayed in one of our standard single bedrooms for five nights. Dear Annie's. Thank you so much for taking care of me during my six week stay. 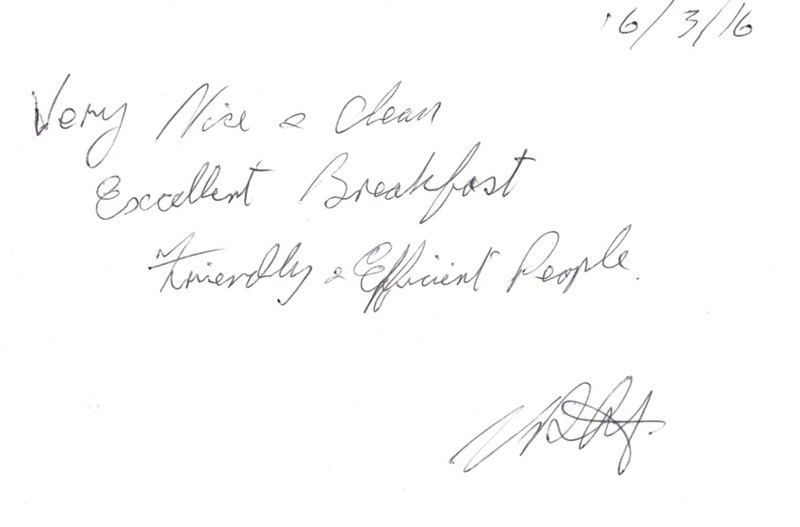 I have been very happy with the cleanliness, food and breakfast and your effort in making my stay a very pleasant time. Kind regards. - Feedback from a guest from Denmark who stayed with us for six weeks whilst studying and taking exams at South Tyneside College's Marine School. 5* Fully satisfied with your service, keep improving. Thanks. 5/5. Myself, husband and 2 children have just stayed at annies guest house for a 3 night break and couldn't fault anything. Staff very welcoming, very clean and comfortable room and breakfast was lovely. All the little added extras are lovely cannot rate this bed and breakfast high enough. Will definately come back again. - Online review from a family of four who stayed in our standard quad room for three nights. Good value for money. Very friendly. And in a good place to local food places. - Guest feedback after a three night stay in one of our en suite bedrooms whilst attending a course at South Tyneside College's Marine Safety Centre. Really enjoyed our little family break. Staff very welcoming, the room was very clean and comfortable and breakfast was lovely. Would highly recommend this bed and breakfast. 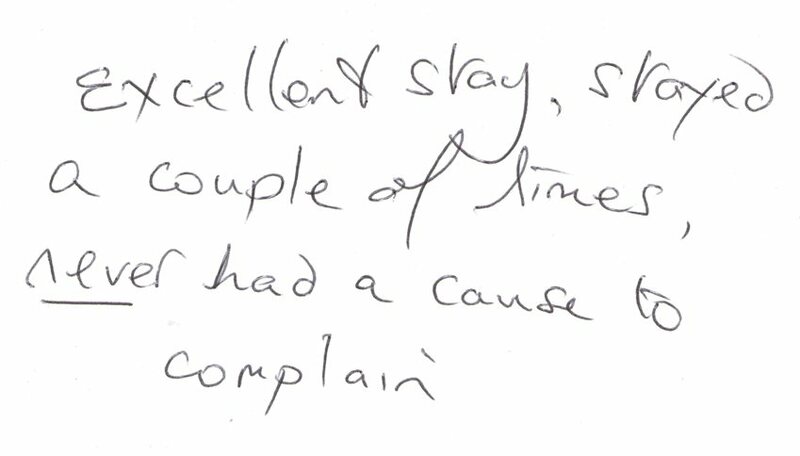 - Feedback from a family of four who stayed in our standard quad room for three nights. 10/10 Couldn't find fault anywhere absolutely brilliant spotlessly clean everywhere couldn't recommend this place enough and anyone who knows me will know it must be good. - Online review left for us after a four night stay in one of our standard single bedrooms. Had a great stay! Thank you! Bed was very comfy and breakfast was very good. Everyone was very friendly. Thanks again, I enjoyed my wee break! 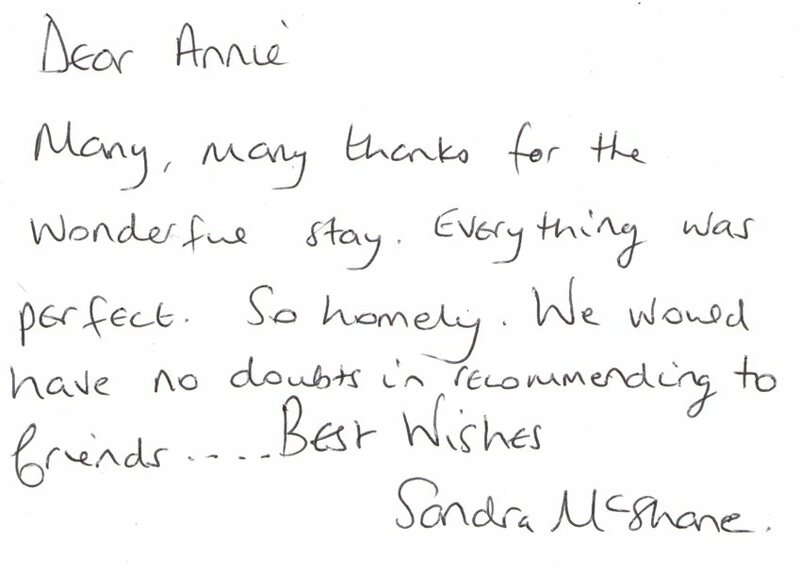 - Feedback from a guest from Scotland who stayed with us for two nights. It's a nice place. The service and people are really very good. Next it I will be coming definitely I will be coming here. Really lovely guest house. Clean, comfortable rooms and lovely reception. On arrival I was greeted with a smile and staff were very friendly. 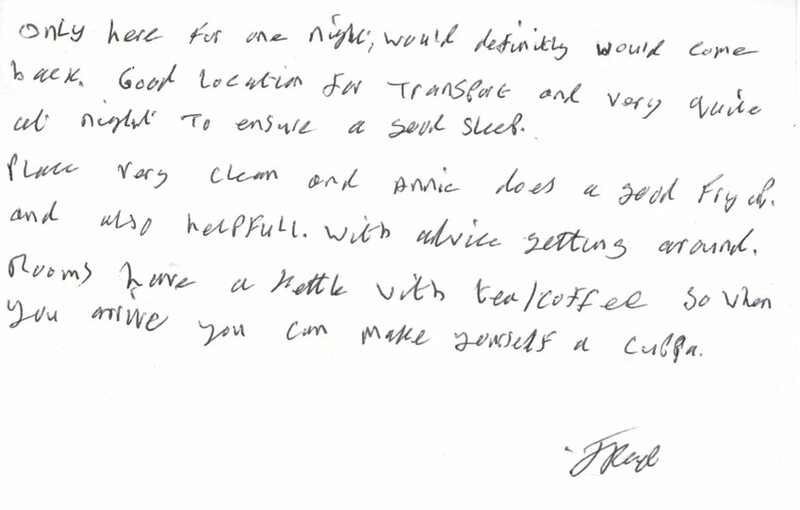 - Feedback from a guest who stayed with us for five nights whilst taking exams at South Tyneside College's Marine School. Can't fault it! Thank you! - Feedback from a vet who stayed with us for three nights whilst working in Harton Nook aka The Nook in South Shields, five minutes drive from us. It was very nice to stay here. The room was nice too and the food was too. 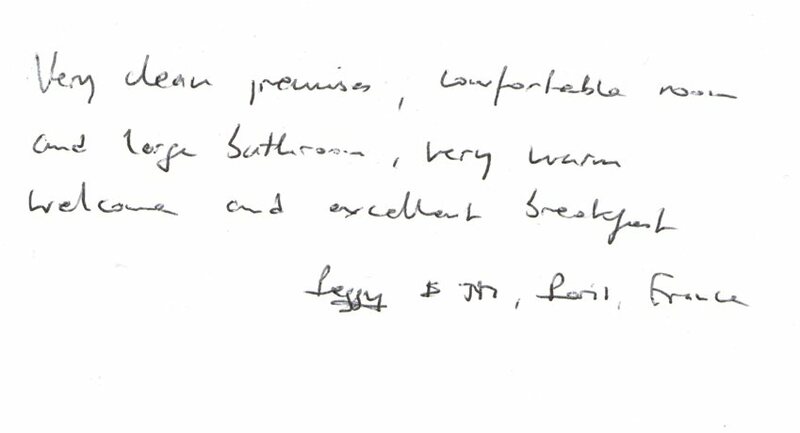 - Feedback from guests who occupied one of our en suite double bedrooms. My stay was very pleasant with friendly staff, clean rooms and lovely breakfast. 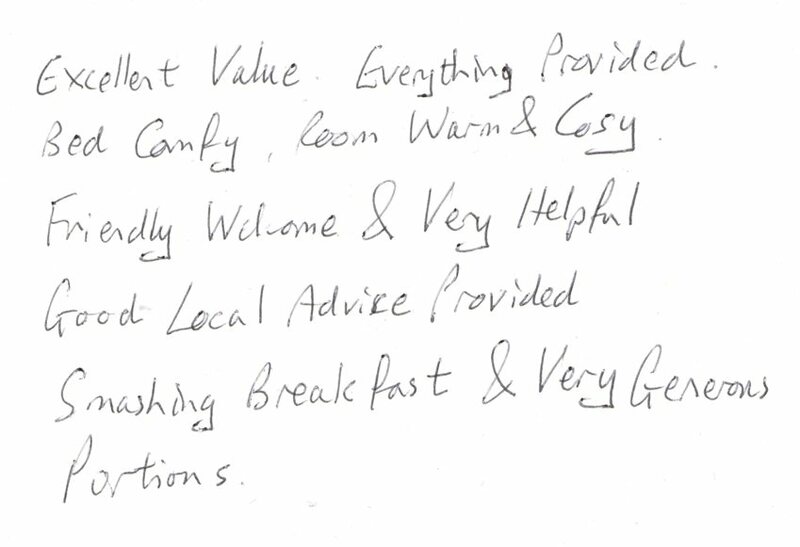 - Feedback after a three night stay in one of our standard single bedrooms. 5* Enjoyed my stay here, best in the area and would highly recommend! Stayed for three nights. Breakfast excellent with very good choice. Accommodation very clean & tidy. Room warm and comfortable bed. 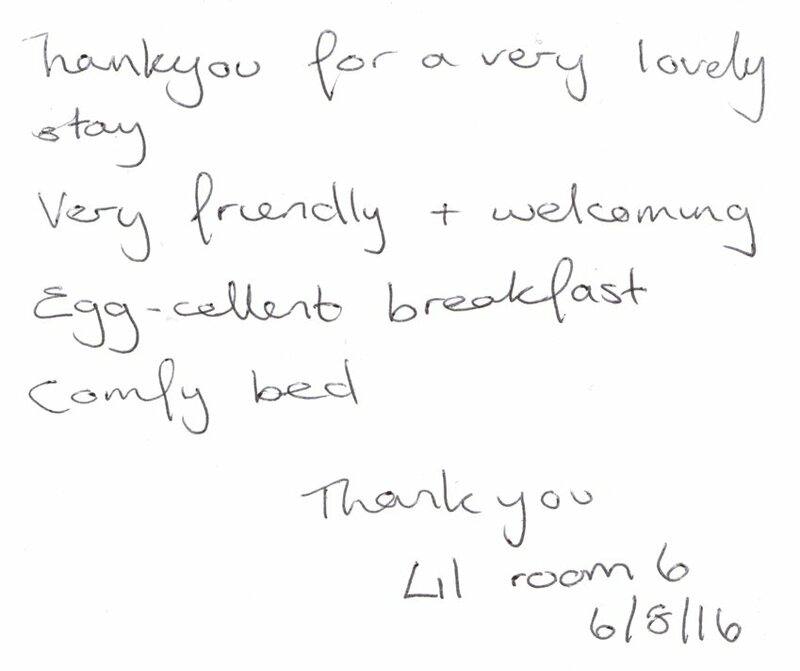 - Feedback after a three night stay with us over Easter 2016 in one of our standard double bedrooms. Exactly what is expected from North East people - warm, welcoming and wonderful. Thank you June for our short but pleasant stay. I have your guest house number in my phone and the next time I'm back your's is the first place to call. Regards. 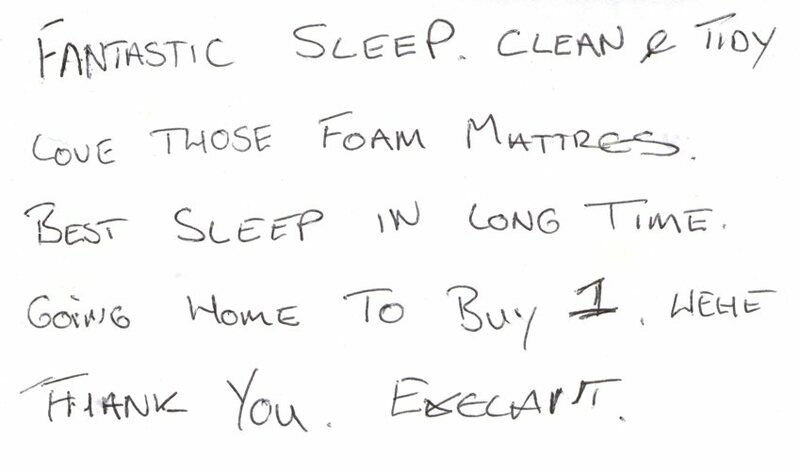 - Feedback from guests who occupied our standard twin bedroom. Very clean, very comfortable, very friendly, would recommend this guest house to anyone, very impressed at value for money. 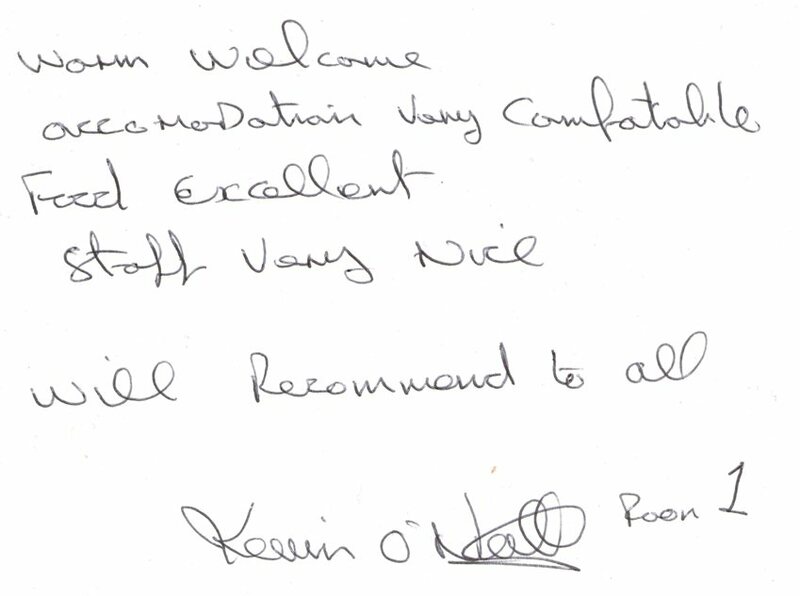 - Feedback from three guests who occupied our standard quadruple room before departing on holiday to Ireland via Newcastle Airport. It was a great staying. Good service, very clean and a proper breakfast highly recommended for those, like me, is cycling along Hadrian's route. Thanks. 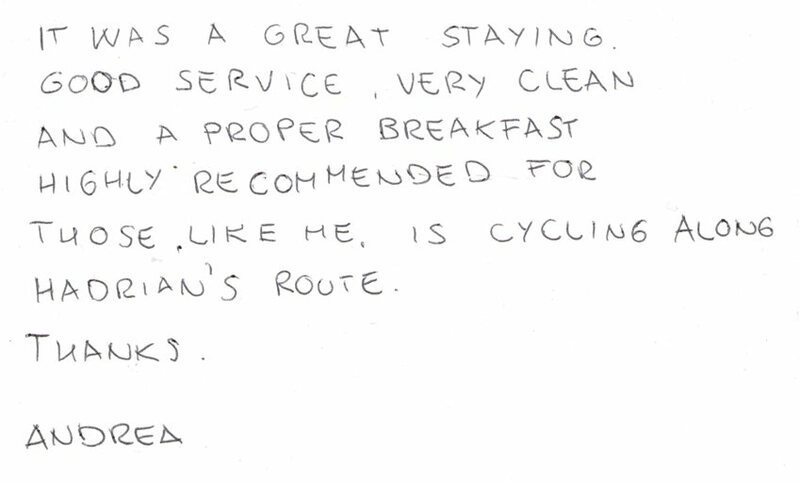 - Feedback from an Italian guest who stayed with us before starting Hadrian's Cycleway aka National Cycle Route #27. I would recommend this guest house to anyone. The accommodation, meals and hospitality are excellent. Beautiful rooms, excellent decoration. Should I pass this way again I would stay here. Thank you. 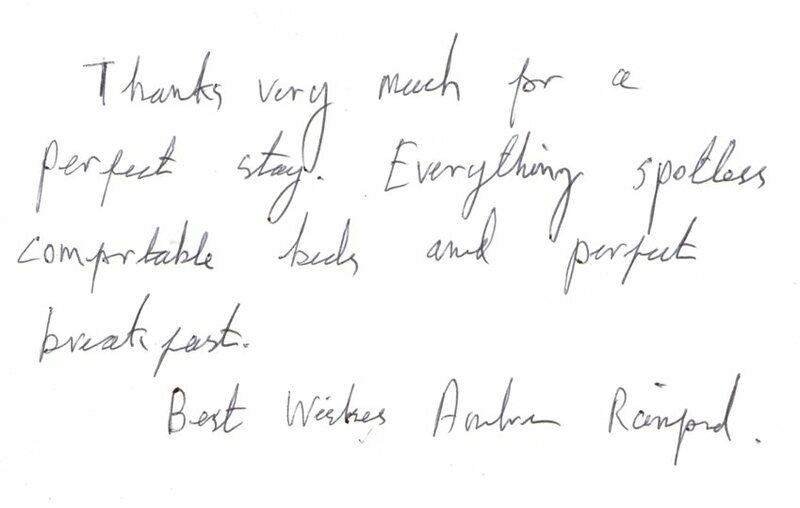 - Feedback from four cyclists who stayed with us in two en suite twin bedrooms. Lovely staff. Good atmosphere & room. 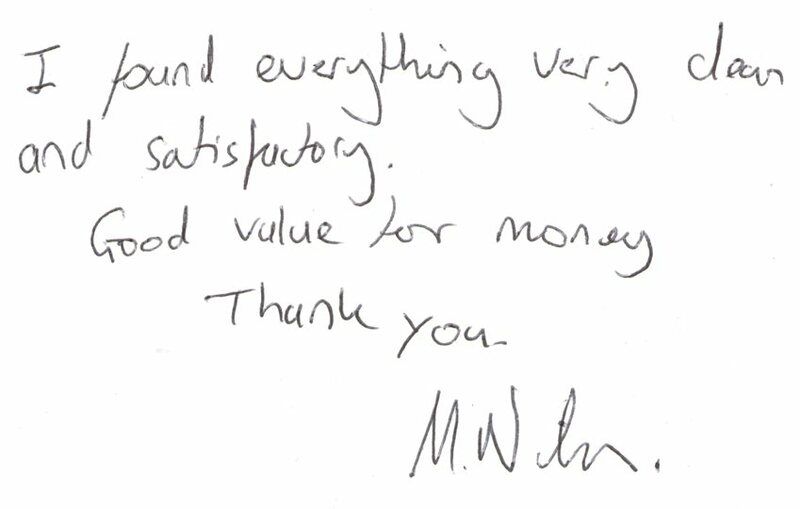 - Feedback from a guest who stayed with us whilst visiting the Nissan car factory in Sunderland. Had a lovely stay. I've been working up here for seven days and coming back to a clean comfy room, very nice breakfast & friendly people. 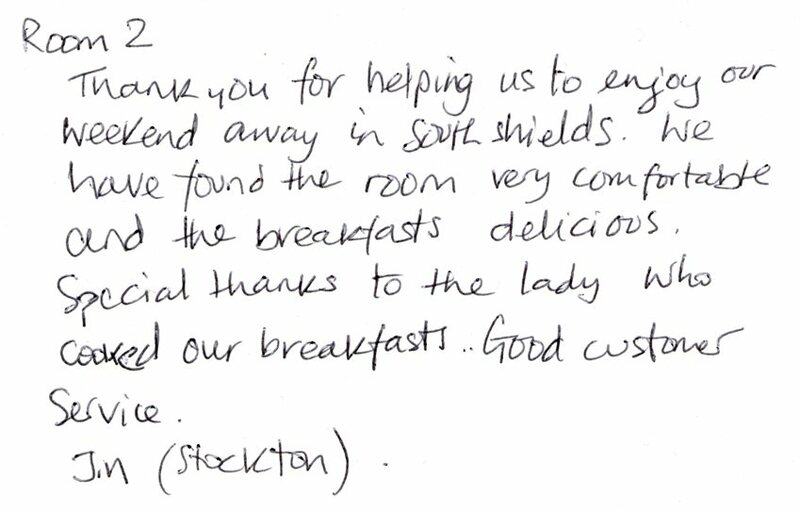 - Feedback from two guests who occupied our standard twin bedroom for seven nights whilst working at Tyne Dock / Port of Tyne. 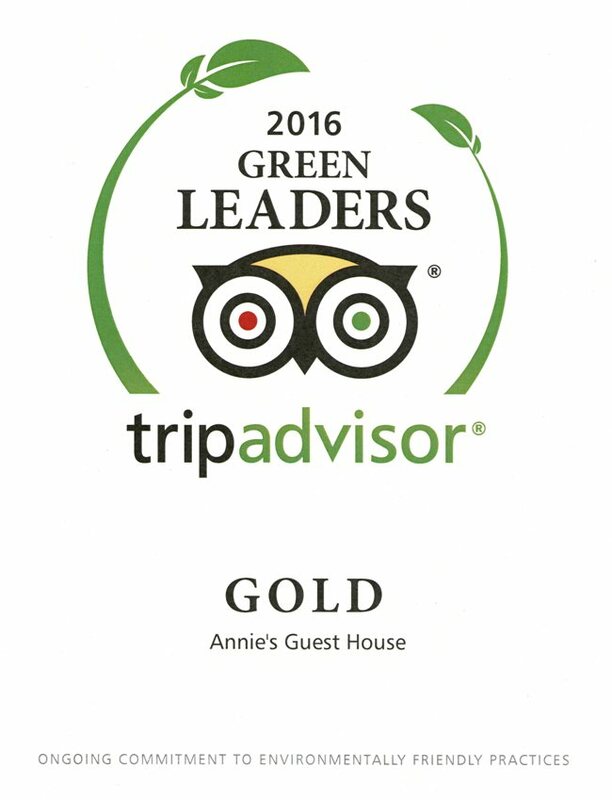 Our Trip Advisor Green Leaders Gold award certificate for 2016. 5* A fab place to escape from the hectic life style in London. Many thanks. Clean & comfortable - good food. 5* Great job thank you I sure enjoyed my stay here I highly recommend it. 10/10 Exceptional. Good value & location & comfort of bed. The guest house has all the facilities that you could need. The rooms are clean and the beds are comfy. Great choice of food for breakfast and tasted lovely. Had a great stay and will be coming back again!! 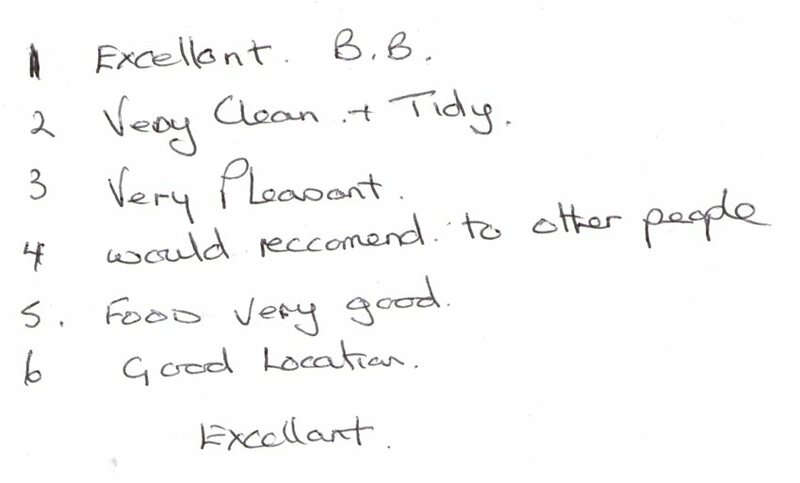 - Feedback after a stay in one of our en suite double bedrooms. Very nice & clean. Excellent breakfast. Friendly & efficient people. - Feedback after a two night stay in our standard quad room. 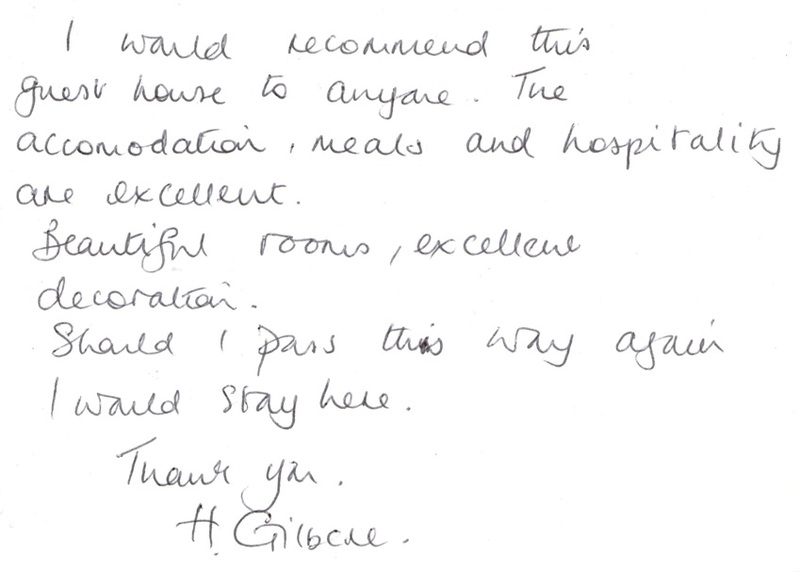 - Feedback from a family of three who stayed in our standard quad room. Very warm, comfy room, a lovely stay & lovely breakfast. Thank you. We will be back. 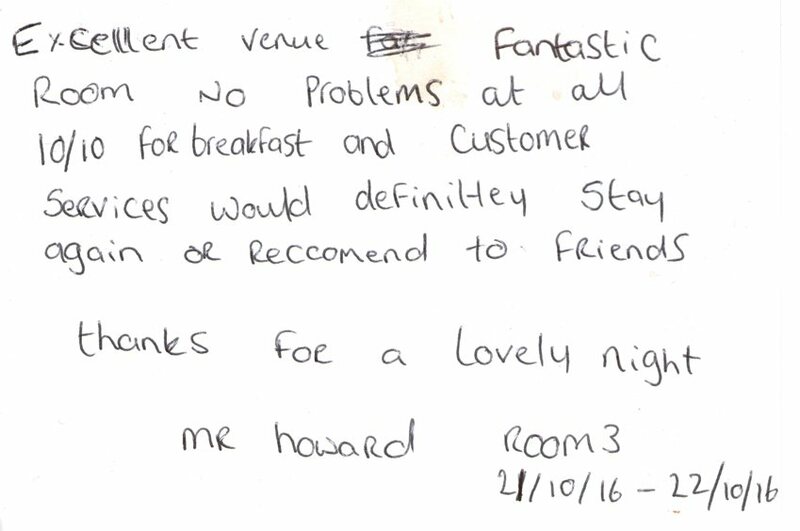 - Feedback from a group of guests who stayed with us whilst attending South Tyneside Magic Festival 2016. What a lovely place to stay!! Lovely comfy beds, beautiful cooked breakfast and nice hospitality. We'll be back!! Thank you. Couldn't believe how well stocked the tea, coffee etc. 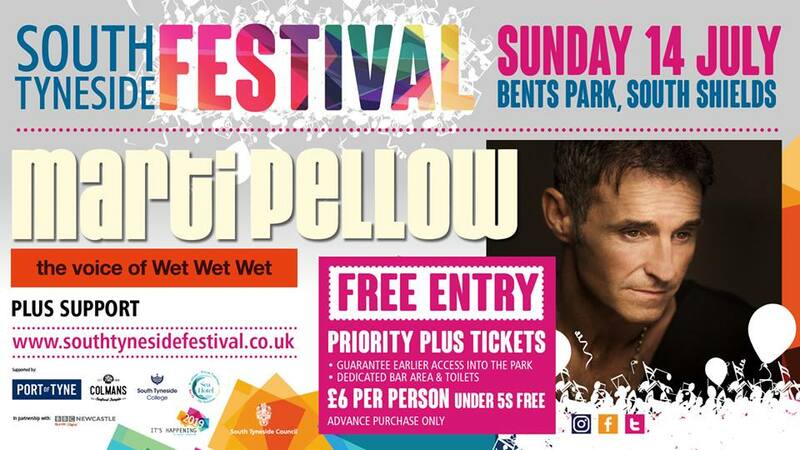 - Feedback from a family who stayed in one of our en suite triple bedrooms, visiting to see Wet Wet Wet at the Metro Radio Arena in Newcastle upon Tyne. 8.3/10 Very good. Very nice B&B. Excellent value. Everything provided. Bed comfy. Room warm & cosy. Friendly welcome & very helpful good local advice provided. Smashing breakfast & very generous portions. 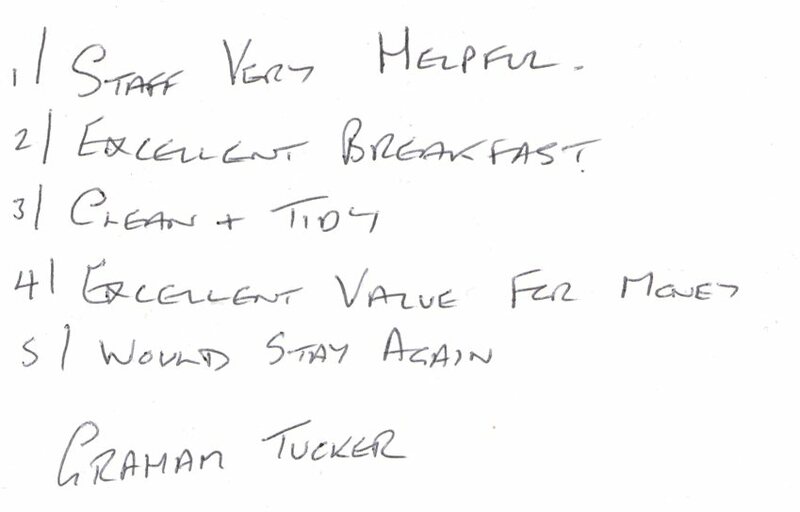 - Feedback from a family who stayed in one of our en suite triple bedrooms. Really quiet in the day which was brilliant with me working nights. The beds are really comfy too. Thank you for a lovely stay. 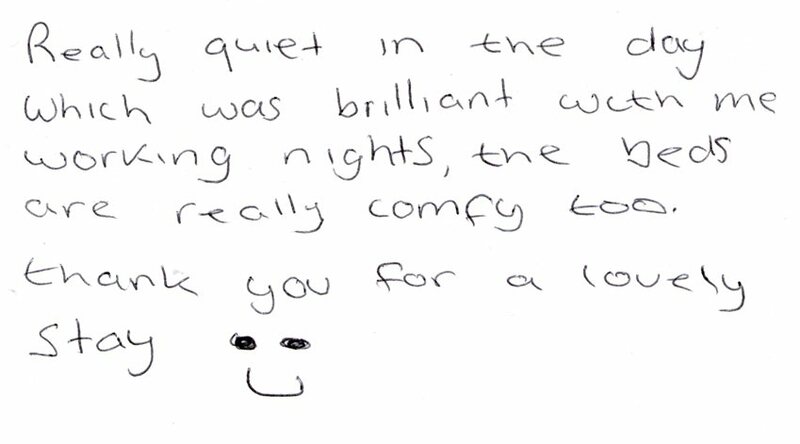 - Feedback from night shift workers who stayed in our standard twin bedroom for a week whilst working in Tynemouth. Very pleasant and clean place to stay. Thanks. 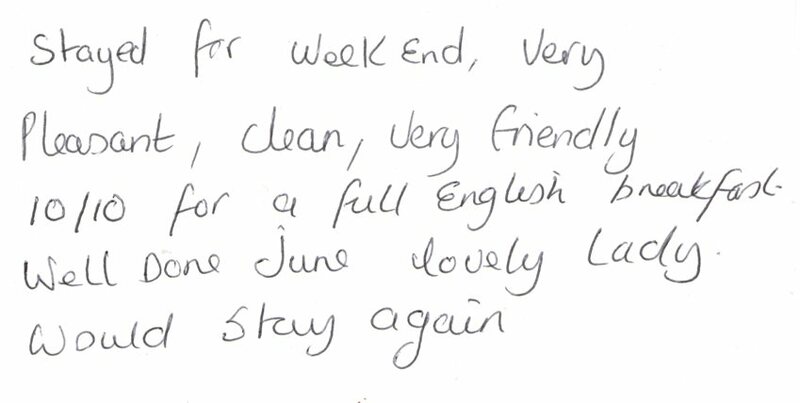 - Feedback from a Bulgarian guest who stayed with us for three nights. Thank you card we received from a family who stayed four night in two rooms. Stay was lovely thanks nice people, quiet B&B and good clean room & service. Thanks for the birthday card as well nice touch. If we come back this way again would use again. 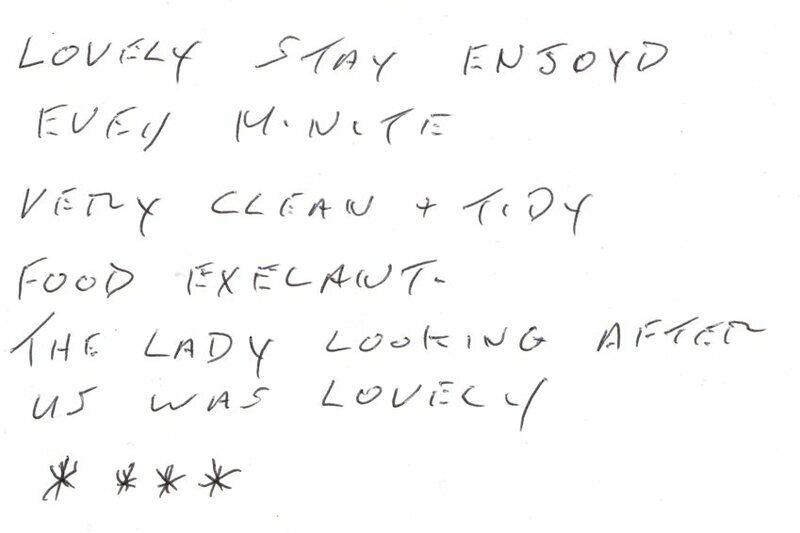 - Feedback after a four night stay in one of our en suite double bedrooms whilst celebrating a 50th birthday. Room 2. Thank you for helping us to enjoy our weekend away in South Shields. We have found the room very comfortable and the breakfasts delicious. Special thanks to the lady who cooked our breakfasts. Good customer service. 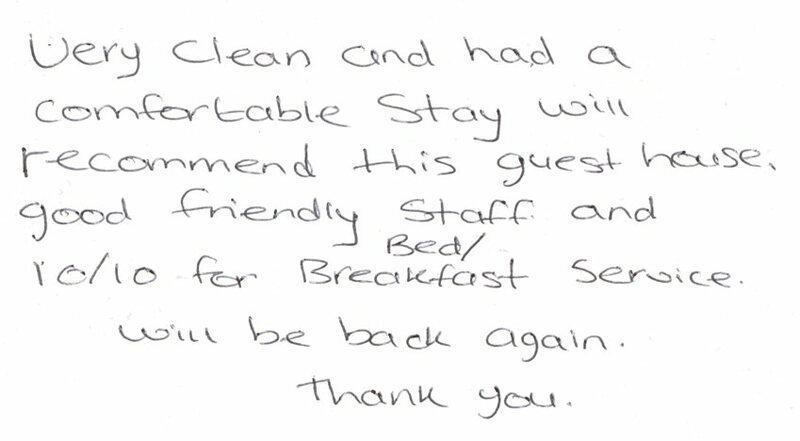 - Feedback after a three night stay in our standard quad room. 9.1/10 2015 online review award. I found everything very clean and satisfactory. Good value for money. Thank you. 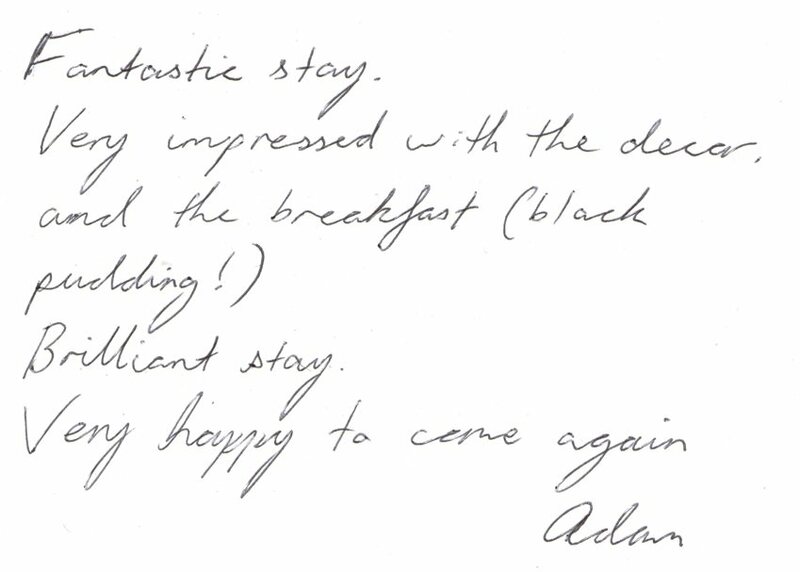 - Feedback from a guest from Sweden who stayed with us for four nights. Very comfortable stay, room facilities first class and value for money. Breakfast sets you up for the day. With thanks. 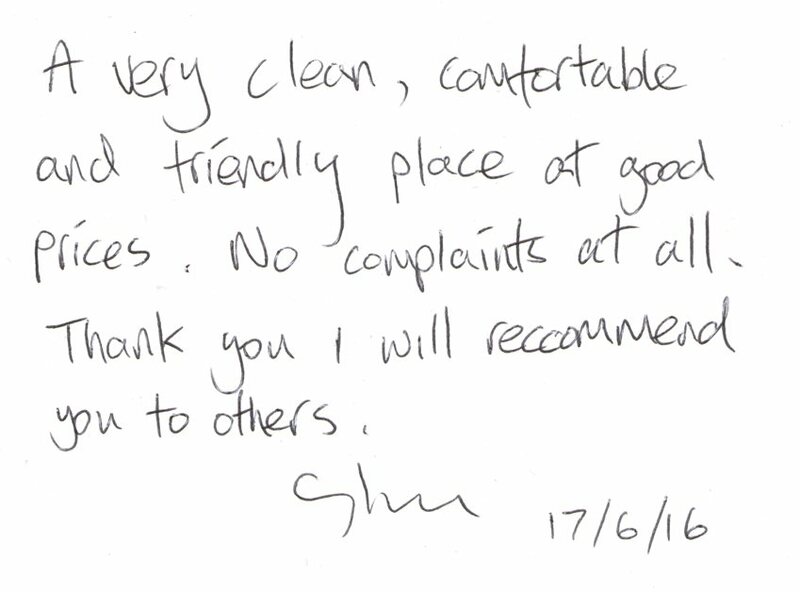 - Feedback after a stay in one of our en suite twin bedrooms. Great stay - really comfortable and the breakfast and coffee was spot on. Would stay again. Very clean and had a comfortable stay will recommend this guest house. Good friendly staff and 10/10 for bed/breakfast service. Will be back again. Thank you. Every time I have work in the North East Annie's Guest House is my first point of call, clean, tidy and tasty breakfast! Last stay was for five months. Would definitely recommend. Our room was always clean and fresh towels etc. every day & tea & coffee in the room & replenished. Beds were very comfortable. I will recommend your B&B to everyone. Thanks again. Room 4. 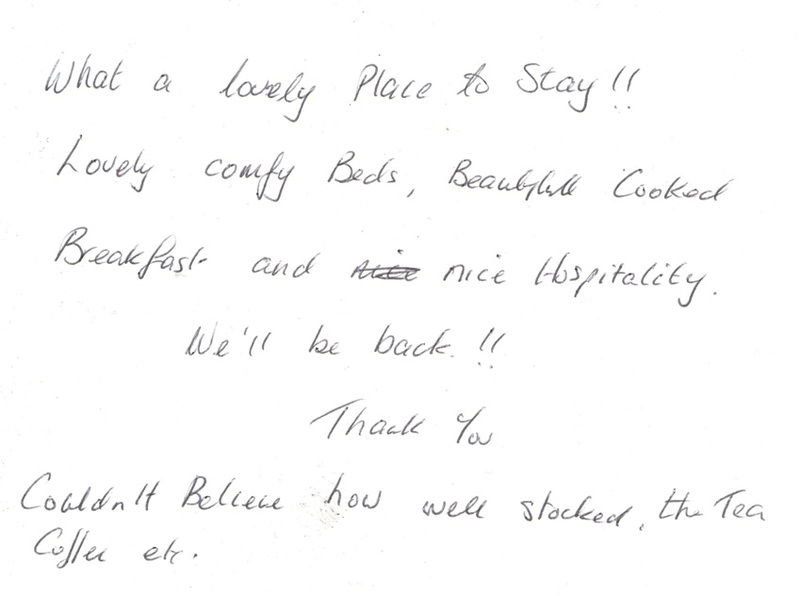 - Feedback from a family of five who stayed with us for three nights. Enjoyed it alot, very friendly staff and great value for money. I would recommend it to anyone. Thanks alot. - Feedback after a five night stay with us. We really enjoyed our stay here the beds were comfy and everywhere was clean. We were looked after very well by June and the breakfast was delicious. The only downfall we had was Man Utd lost to Sunderland. Thank you very much will definitely come again Ann & Phil. Nice name for guest house. 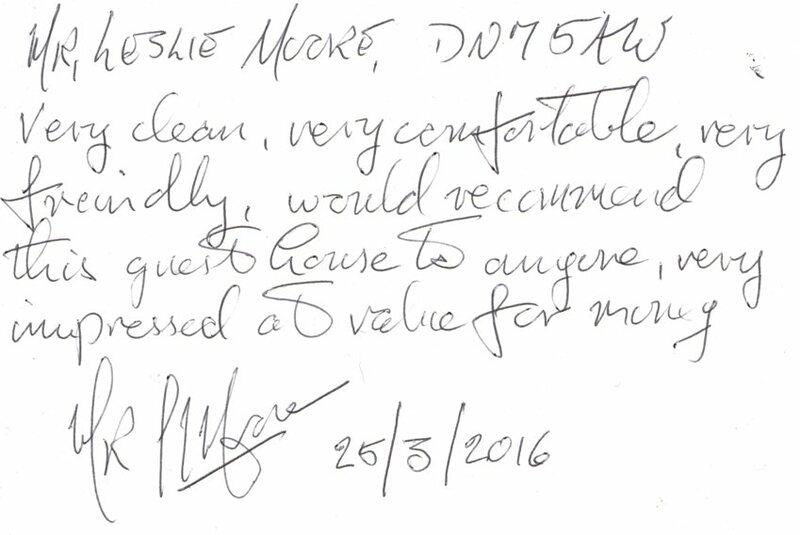 - Feedback after a two night stay in one of our en suite double bedrooms. We were four students travelling over the weekend in Newcastle. Annie's Guest House is conveniently located just 30 minutes away (by Metro) from Newcastle City Centre at near South Shields Metro Station. They were fast in responding to our enquiries during the booking process and the place was cosy, as shown in the pictures. Linda welcomed us to the place and made us felt right at home with her enthusiasm and helpfulness. The accommodation can easily be identified and was within walking distance to the beach, supermarket as well as South Shields Metro Station. The complimentary drinks provided in the room itself was awesome and there's even towels for us to use. The breakfast we had the next morning was great as the lady who greeted us was making sure that all our requests were taken care of. I have unofficially concluded that this is one of the most welcoming places that I have been to. Just one night here seem to be too short for the beautiful place with amazing people. Will definitely come back here again. 5/5 Lovely Guest House. My two friends from Australia and Canada were visiting me and my fiancé for the weekend so we booked the quad room at Annie's Guest House. We weren't too sure how good it would be as the guest house isn't on Ocean Road which is where there are a lot of b&bs (but they are more expensive). The guest house is very close to Marine Park, the sea front, fair etc. and easy to get to via metro or bus. We managed to get an early check in for 11am. When we arrived, a lady greeted us at the door and took us up to our room which was on the top floor. I don't think this lady was the owner, I think she just worked there. She was very sweet. She showed us how to work everything in our room and gave us a lot of information. She definitely made us feel welcome. Our room had a double bed and two singles. The beds were very comfortable as they had memory foam mattresses. In the room we also had a TV, wardrobe, hairdryer, ironing board, iron, towels, sink, mirror, kettle, selection of teas, coffee and biscuits. We were surprised at how much there was in the room as we were only expecting the beds. The room was only £65 pound, so shared amongst the four of us it was very cheap. We were a little worried about having to use a shared bathroom as we hadn't done this before as only really stayed in hotels. However, there was nothing to worry about. There were 2 toilet cubicles with sinks in each and which were very spacious. They were decorated lovely and very clean. The bathroom was my favourite part. They have a big shower which is lovely and very clean and also a lovely bath tub. We found the entire guest house very clean. My fiancé and one of my friends went down for breakfast at around 9am (me and my other friend weren't hungry). The breakfast was included in the price of the room and from what I hear, it was delicious. They got offered a selection of cereals and drinks whilst their breakfast was being cooked. They then had a full English breakfast which everything on. There was only a choice of jams and chocolate spread with the meal. I now regret not going for breakfast. They ate their breakfast in the dining room on the ground floor. This was a small room with three tables but very cute, clean and well decorated. They also had 2 TVs on the wall to watch whilst eating breakfast. Once again, the lady that took us to our room was the one who made the breakfast and chatted away to us. She was very friendly. I would definitely recommend this Guest House to everyone. I think many people might overlook this because it isn't on the Main Street. However, it is cheaper, nicer and still close to everything!